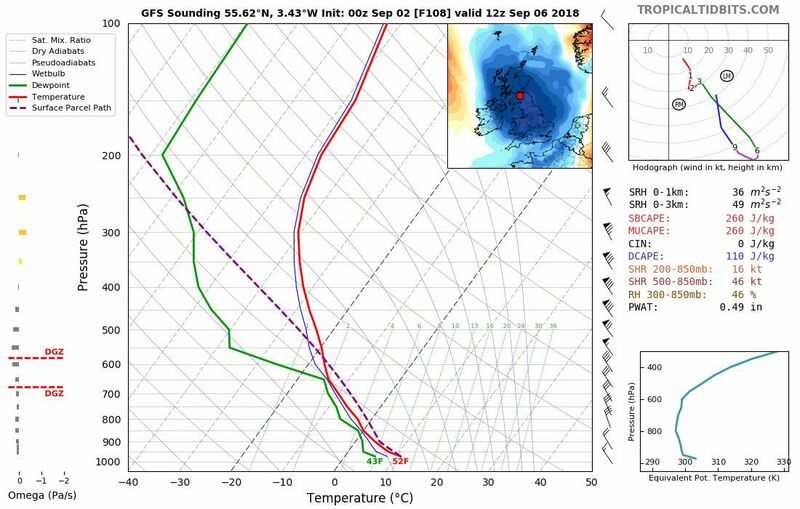 Well the midday sounding is still in thick cloud as expected and the front must be in close proximity. 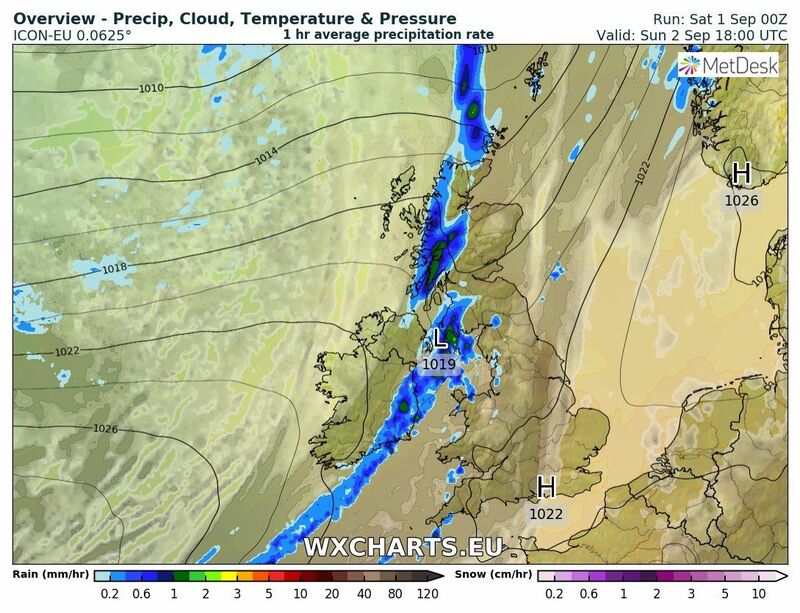 Plenty of sunshine here now with the thick cloud to the south. 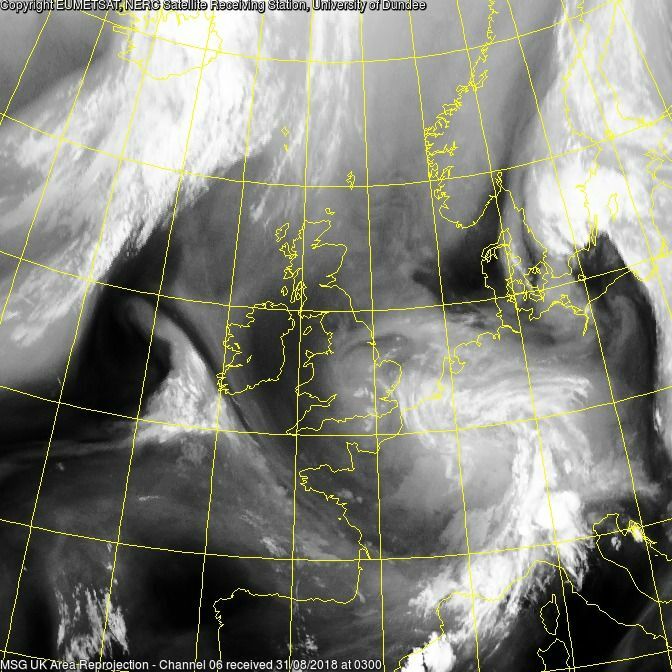 Indeed John. 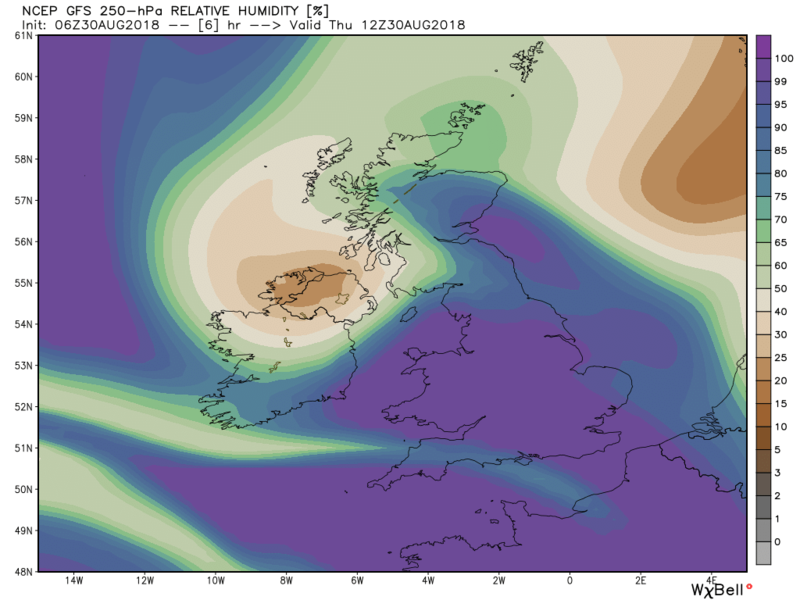 So to fall back on the alternative theory and as there was some large Cu/Cb around at the time I suspect the midday sonde was launched into one. 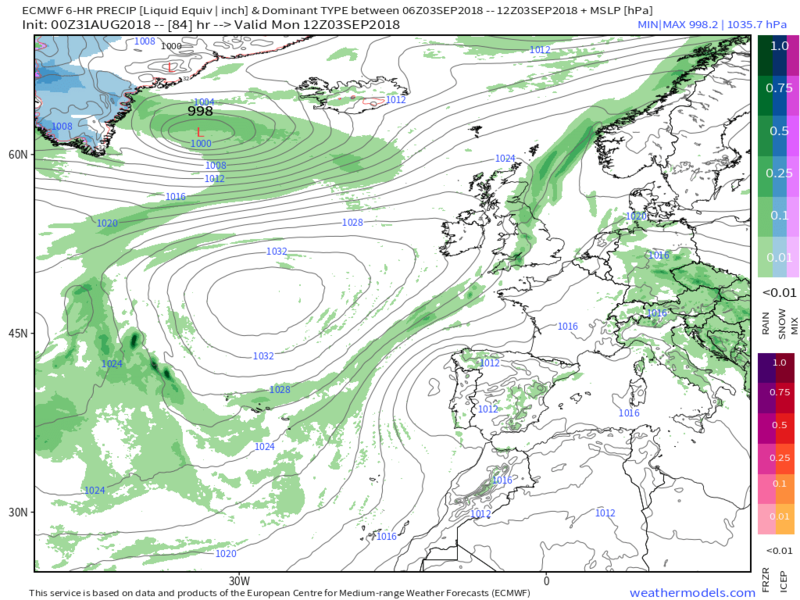 This evening's fax at T72 has a very complex area of low pressure to the north west of the UK with the block to the east connected south west to the Azores HP via the south of the UK. 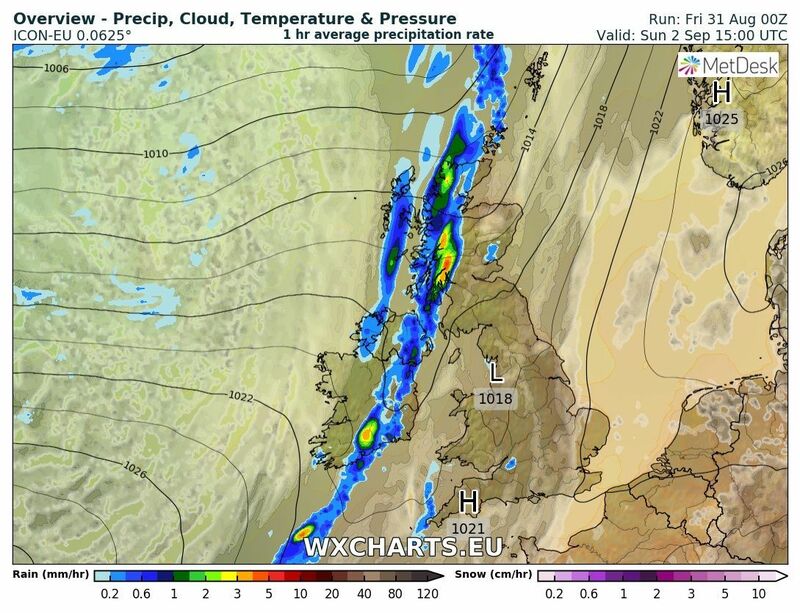 Thus the fronts associated with the former track NNE just to the west of Ireland. 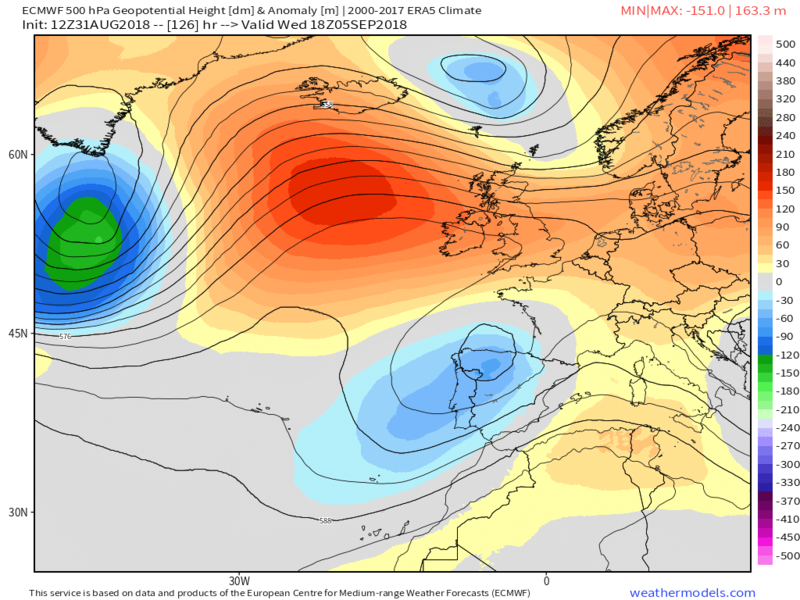 Essentially the next five days can be summed up as a battle between the trough to the north west and the energy tracking north east south of it and the blocking high pressure ridging from the south west into north west Europe which the latter eventually wins after a skirmish at the coal face over the UK.Illustrated quite well by the upper air charts and surface analysis at midnight. 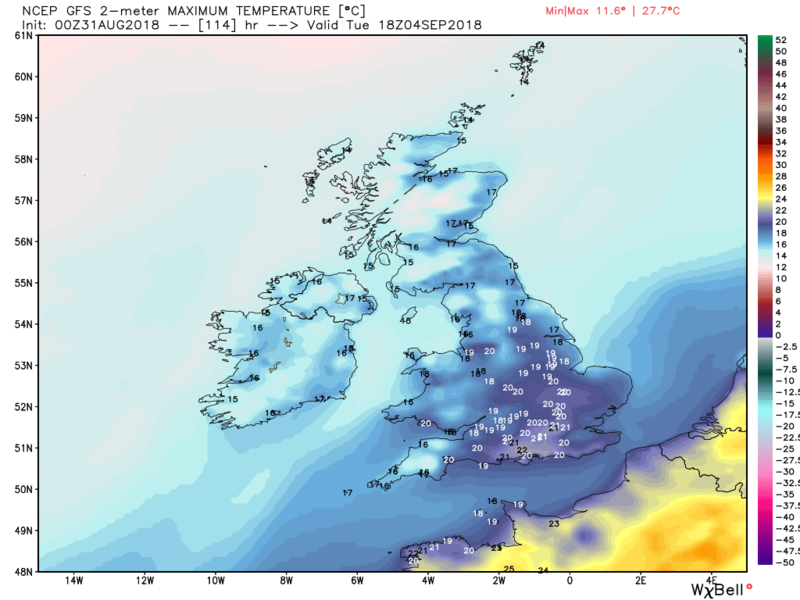 A chilly start with some mist and fog around in some areas which will quickly clear giving a generally sunny and warm day with cloud popping up in central and southern areas. 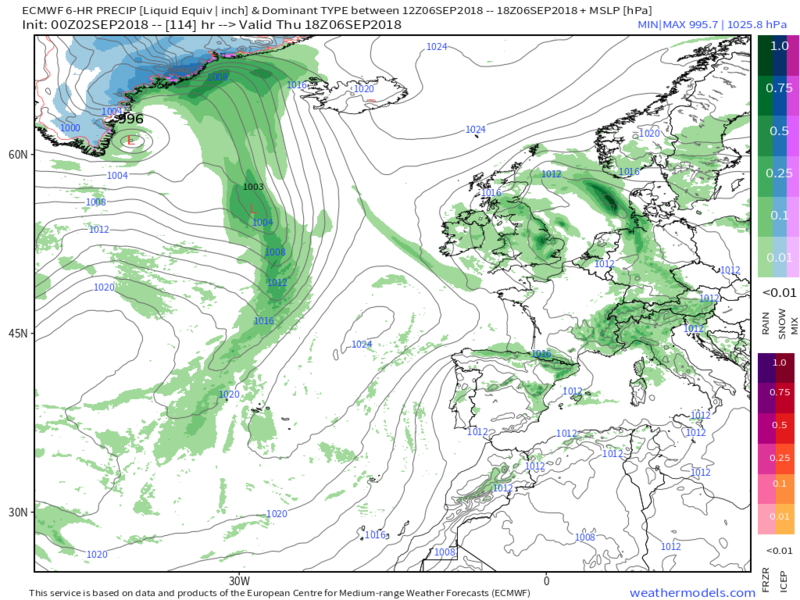 But more general cloud and patchy rain will arrive in the MW and SW areas during the afternoon as the fronts associated with the deep low in the Denmark Straits push slowly east. 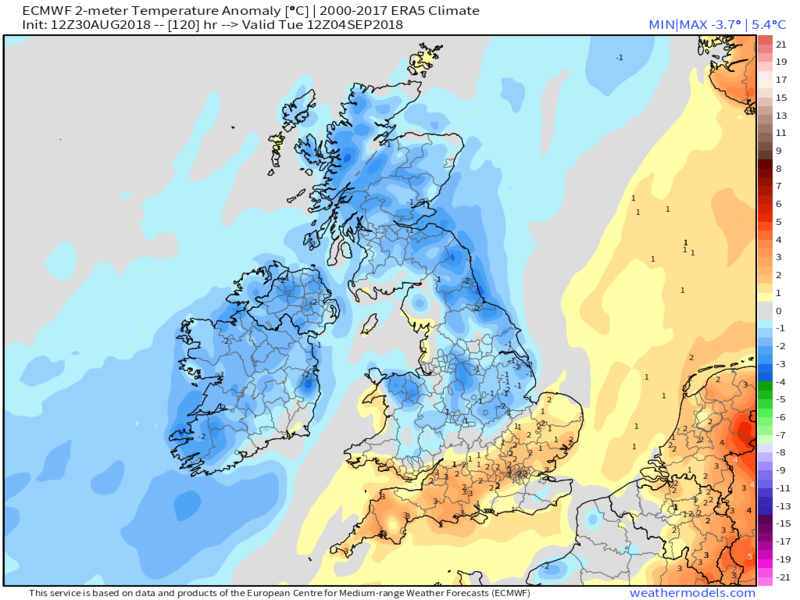 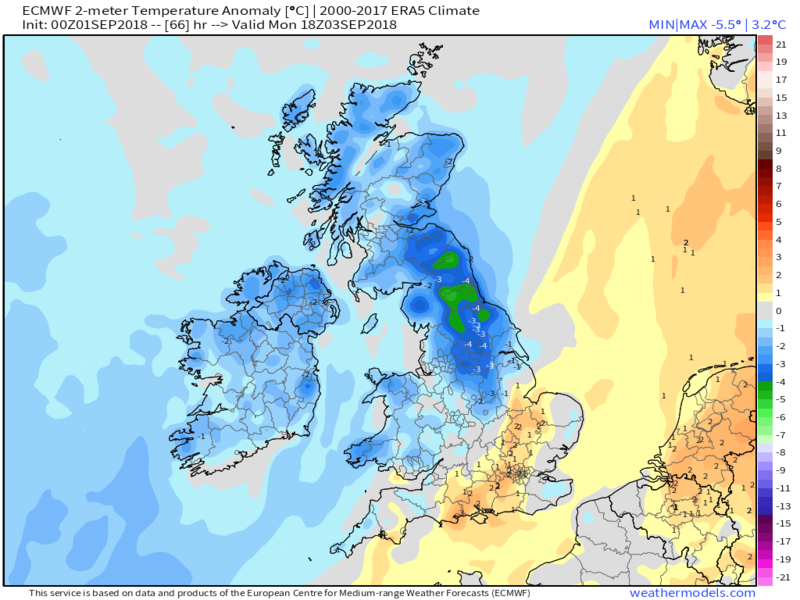 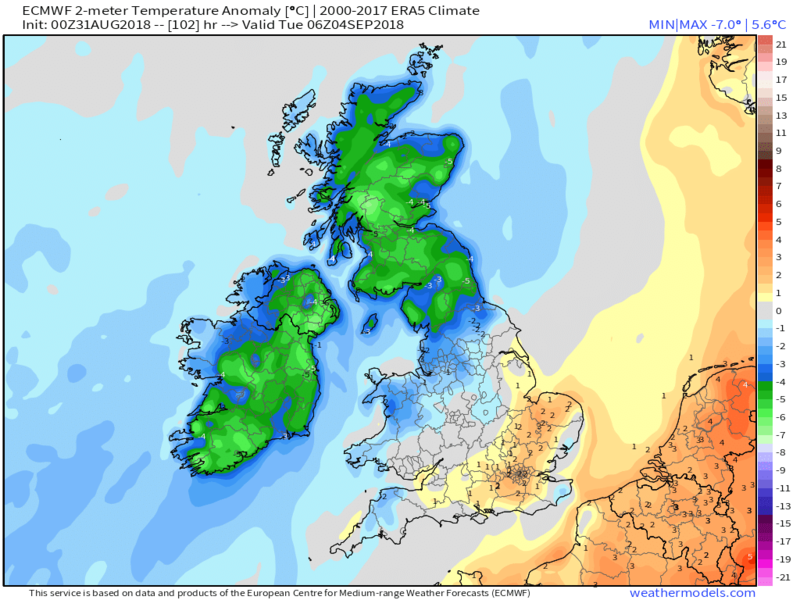 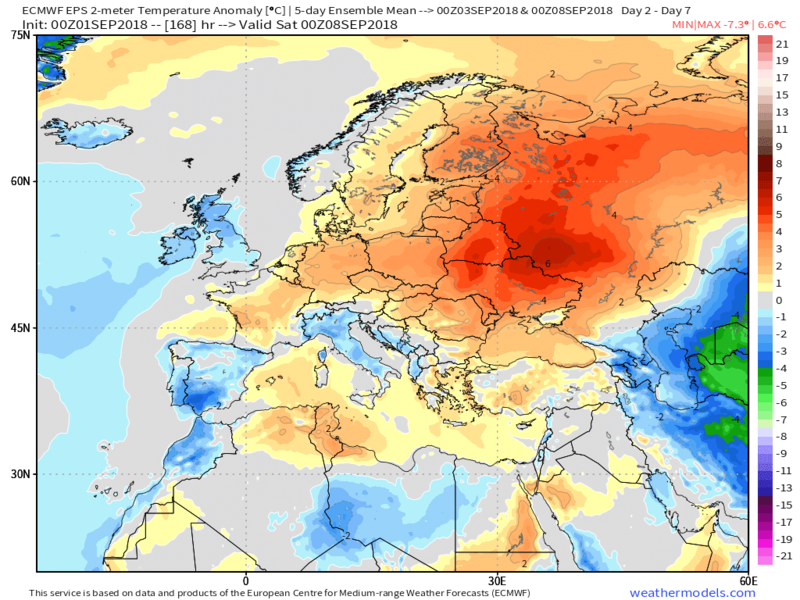 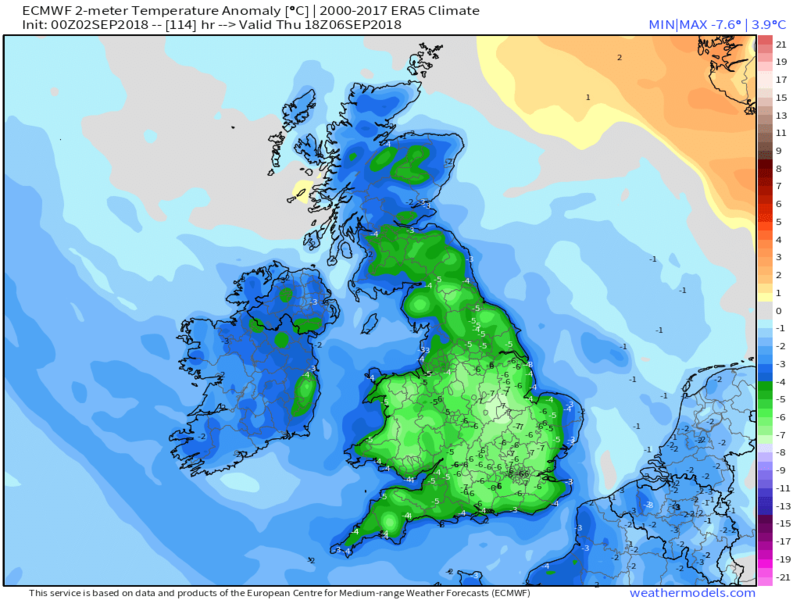 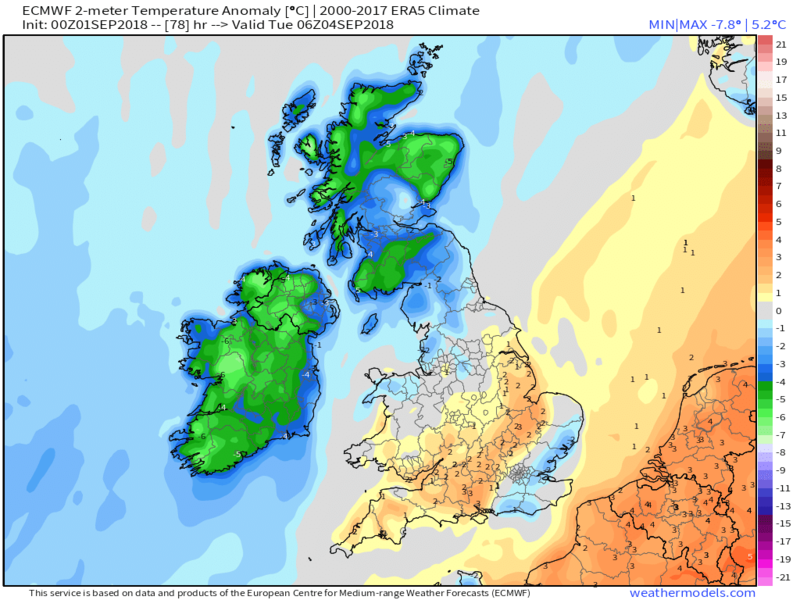 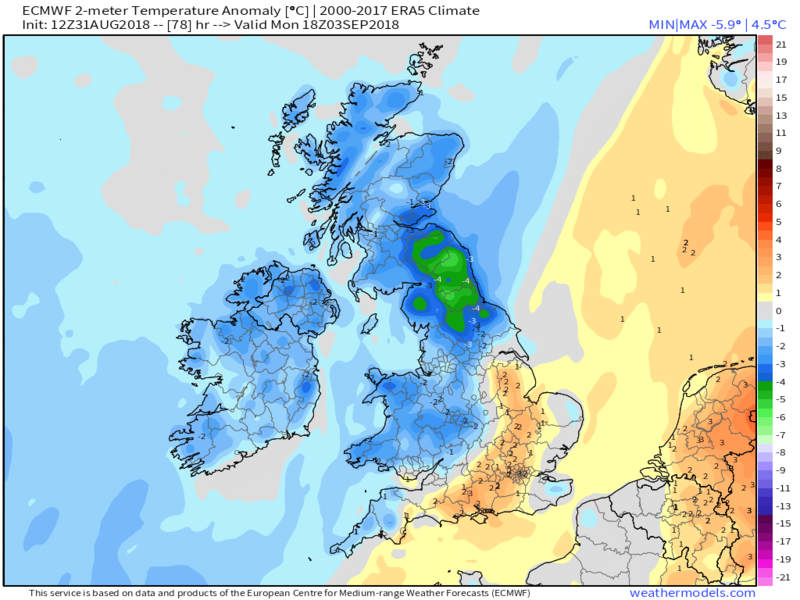 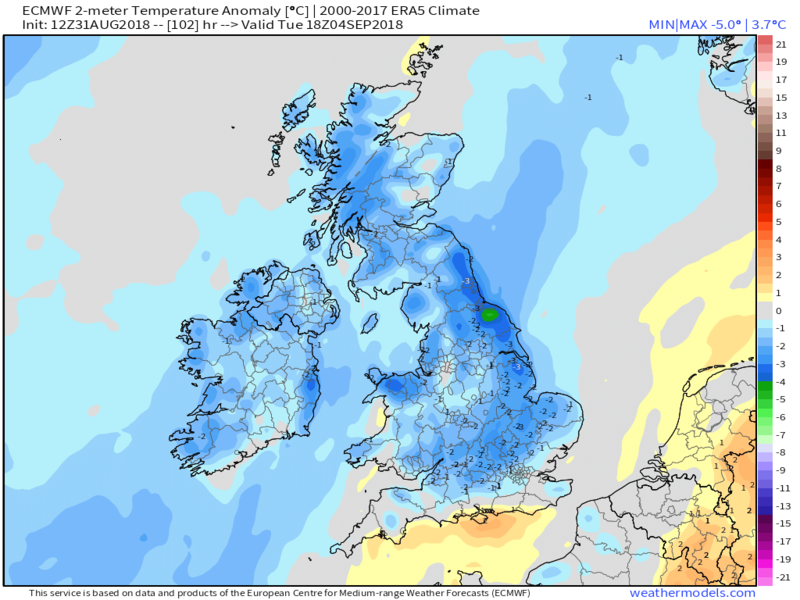 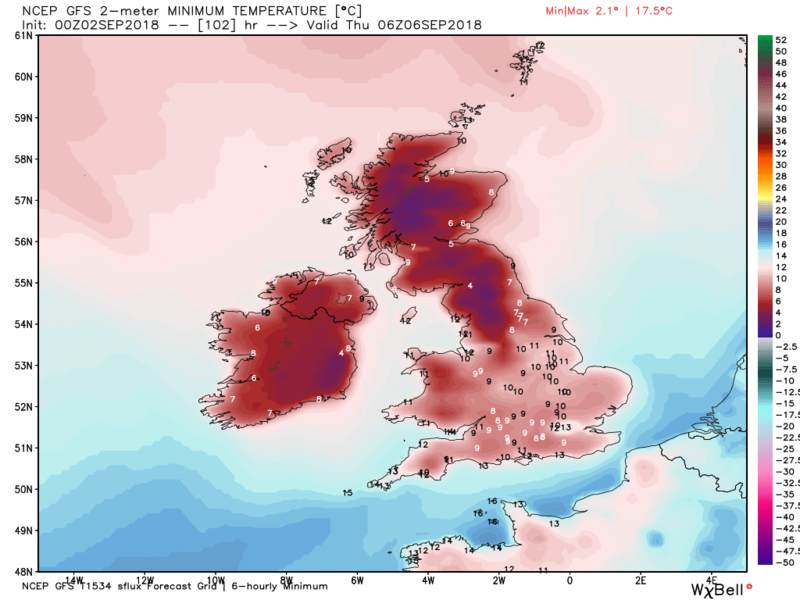 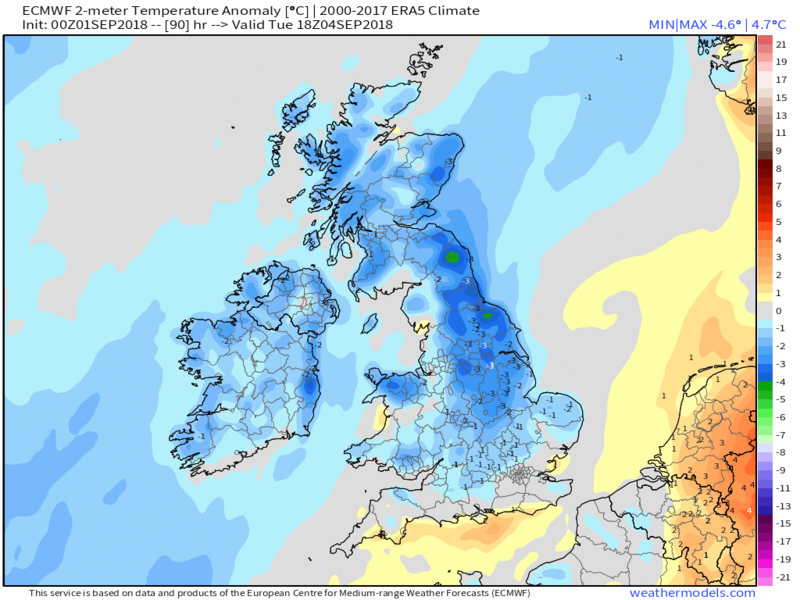 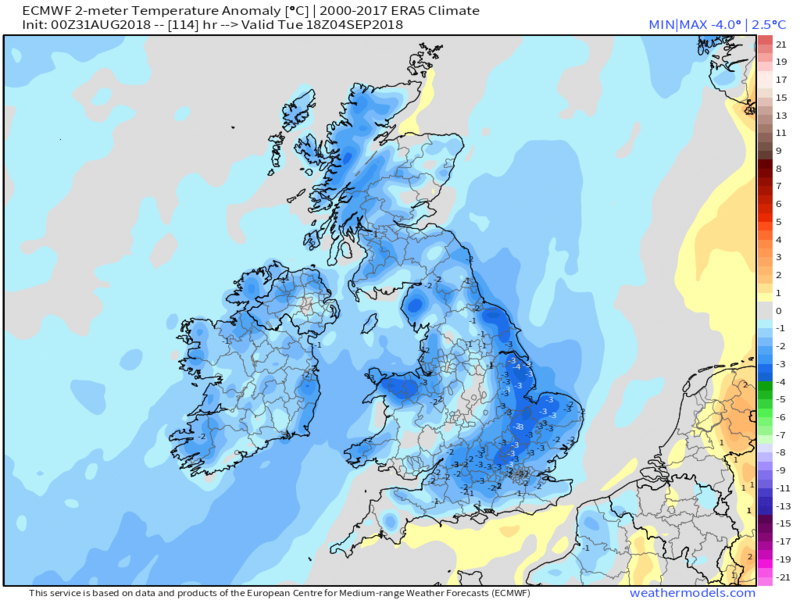 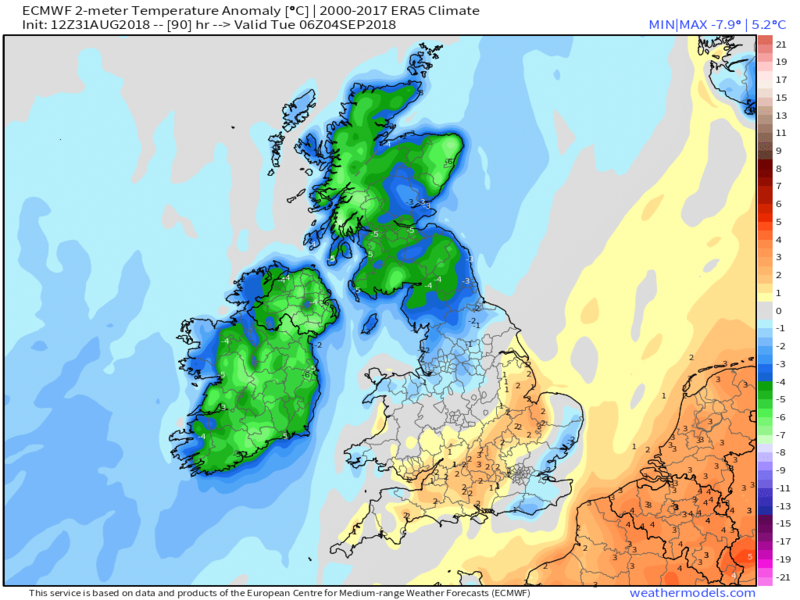 The weakening fronts tend to linger in the west on Sunday thus remaining cloudy whilst again the east will be sunnier and quite warm although generally the temps are a tad above average. 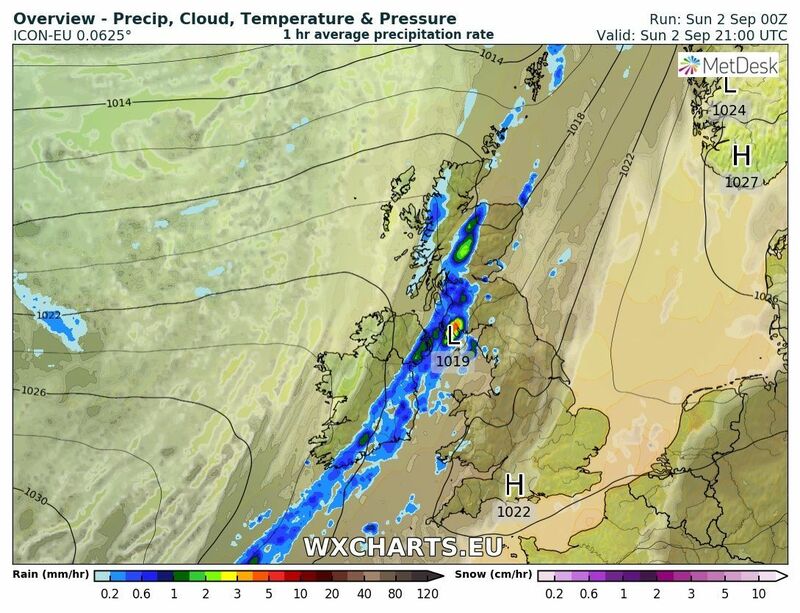 But to the west another frontal wavy is tracking quickly NNE and the band of rain on the front will effect N. Ireland and western Scotland by early afternoon.and start tracking south east. 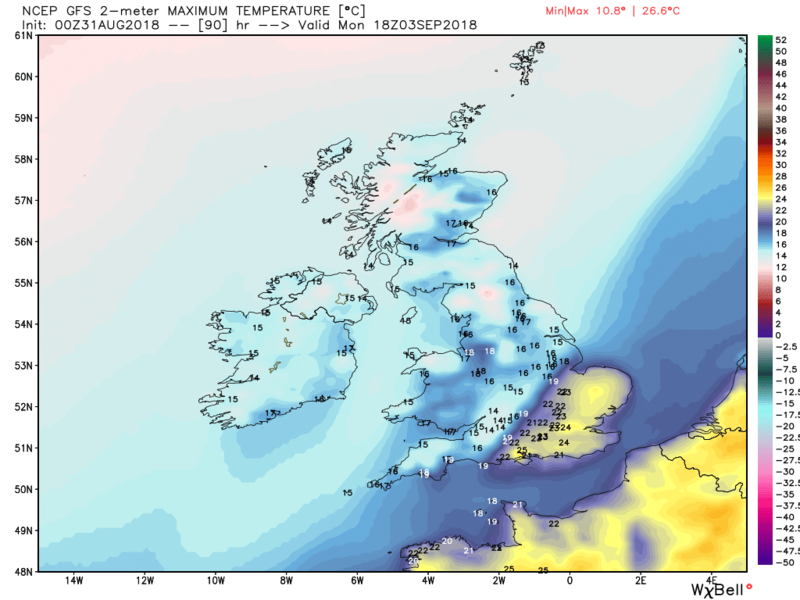 Generally a sunny day on Tuesday and although temps will only be around average feeling quite warm as there is virtually no wind. 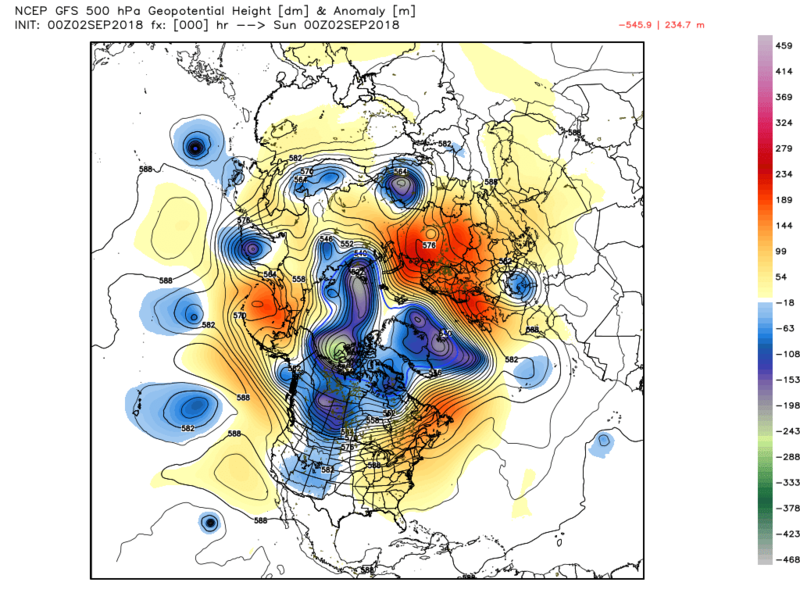 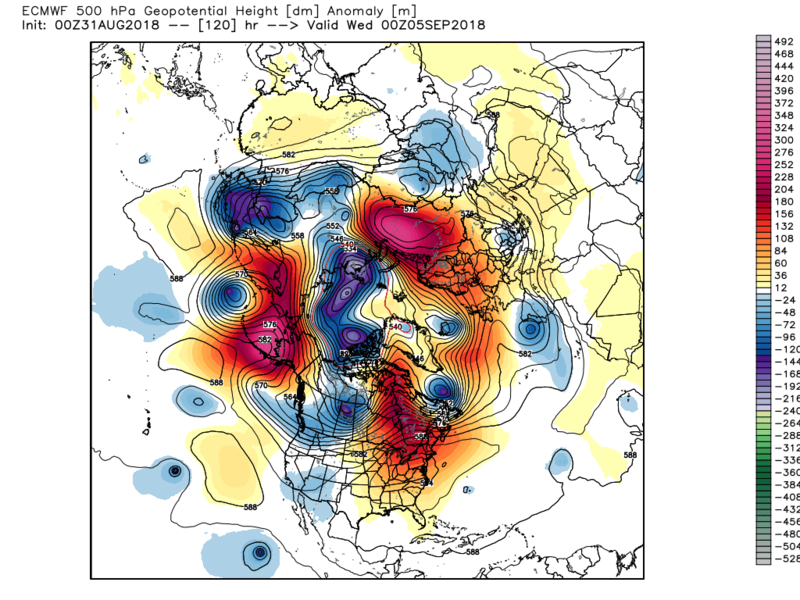 And the NH profile indicates high pressure gaining the ascendancy and is a pretty good illustration of NH ridging in general. 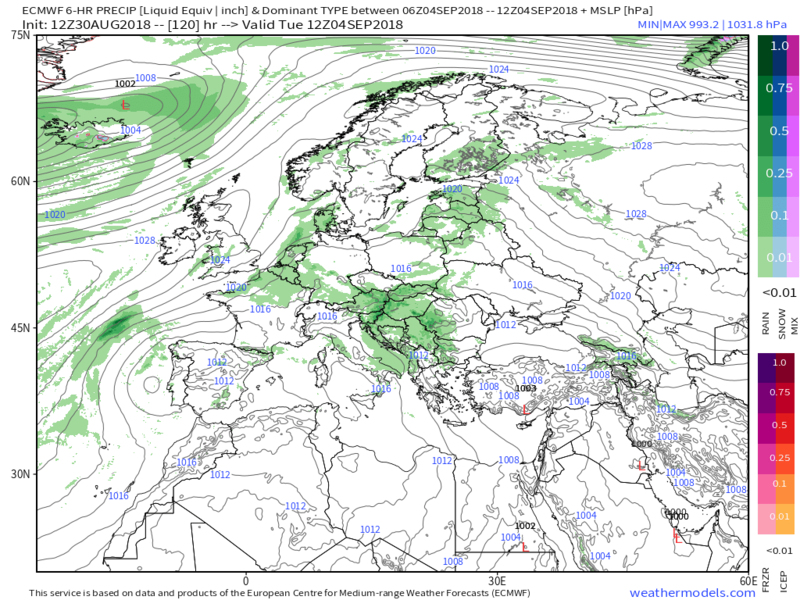 A point made by MV in a tweet yesterday evening. 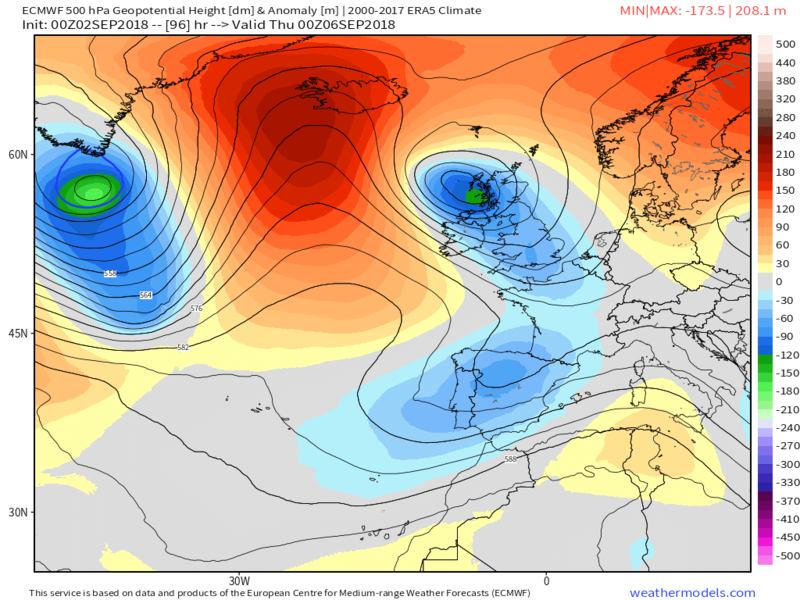 This morning the ecm introduced the idea of dropping the upper trough south to the east of the UK whilst pushing the European ridge further east and thus temporarily (?) 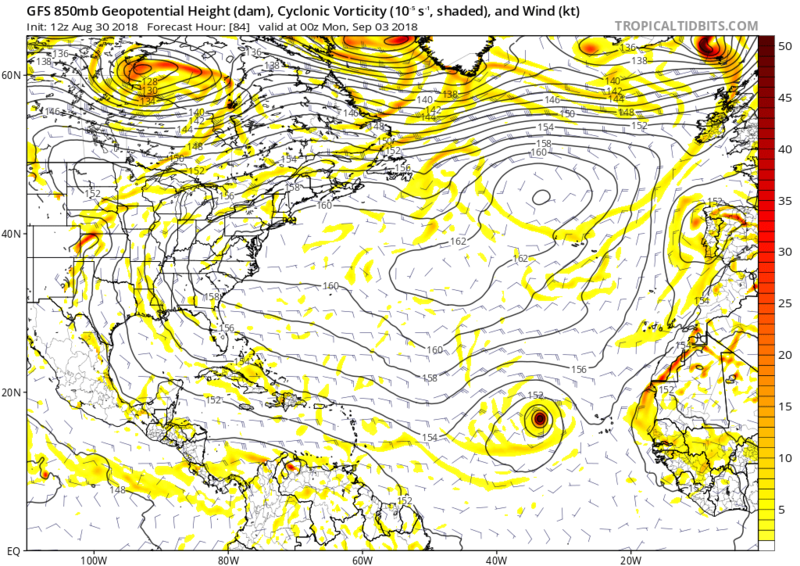 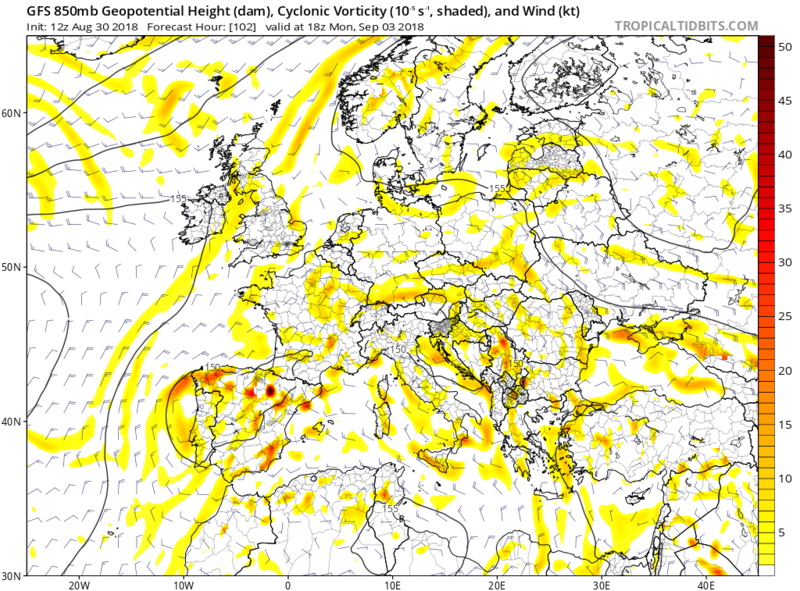 interrupting the Euro > Azores axis resulting in the surface high cell being established further west.  It continues with this idea this evening. 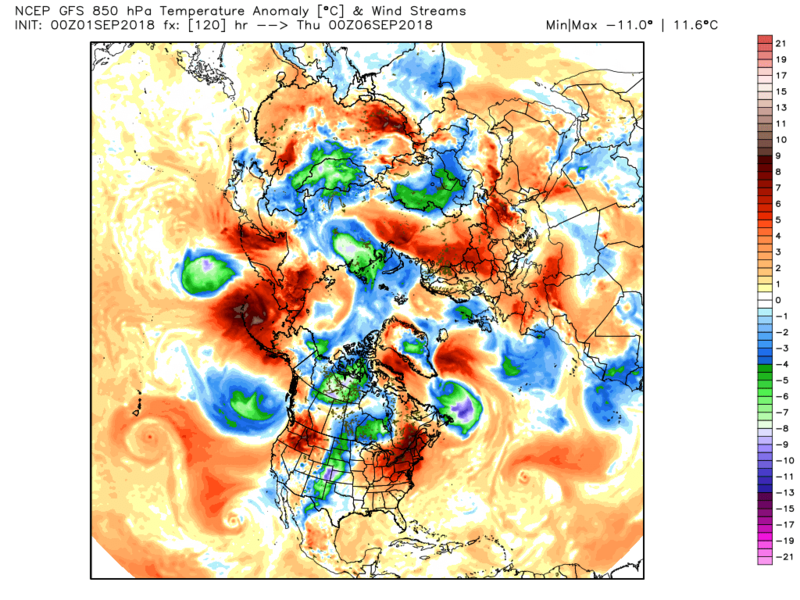 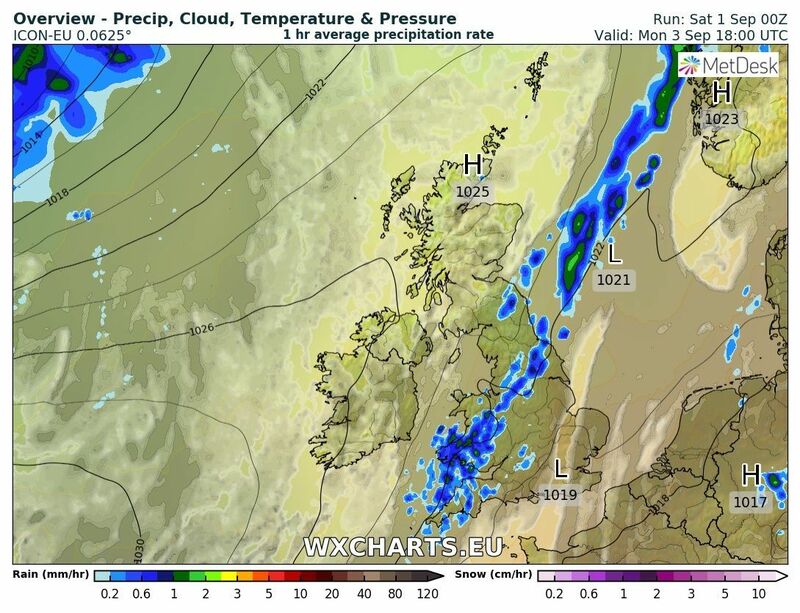 But this still portends dry and quite pleasant weather and maybe chuck some fog into the mix in the chilly mornings. 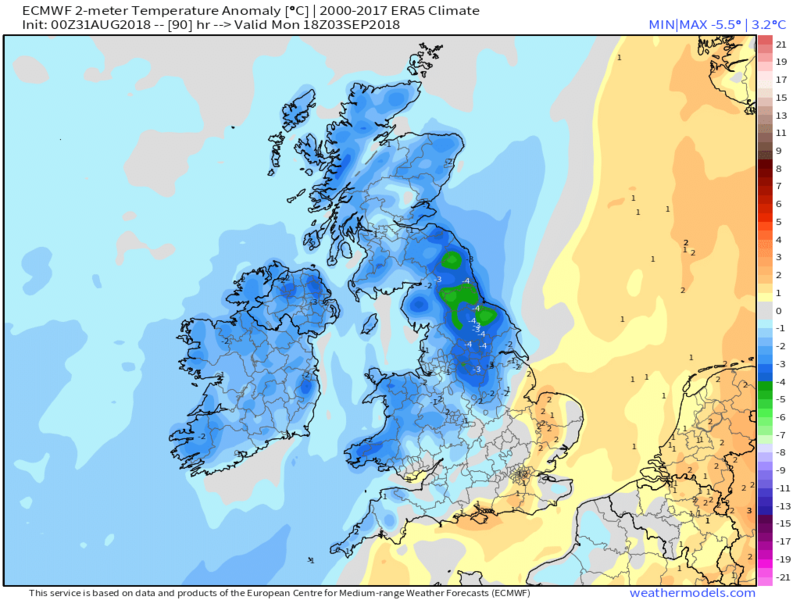 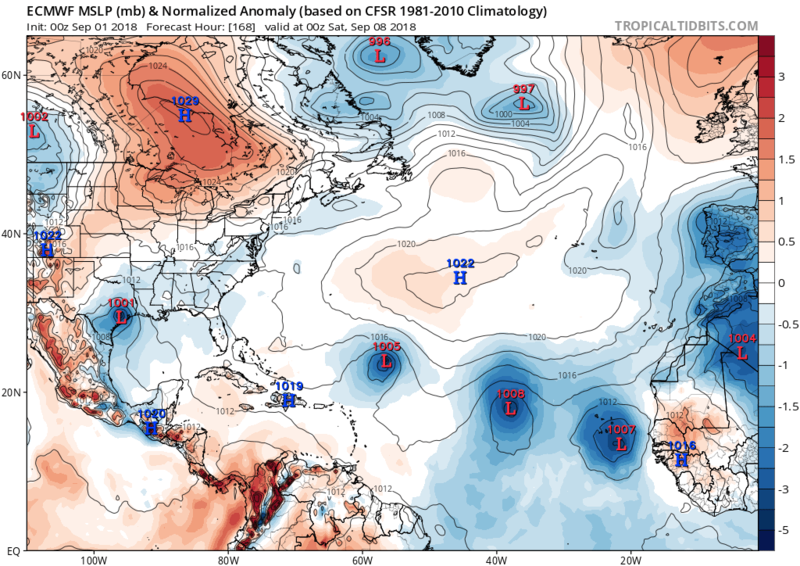 Strong indications over the last 24-48 hours of a change of pattern, much of which is later than the short range, although the seeds are sown within it. 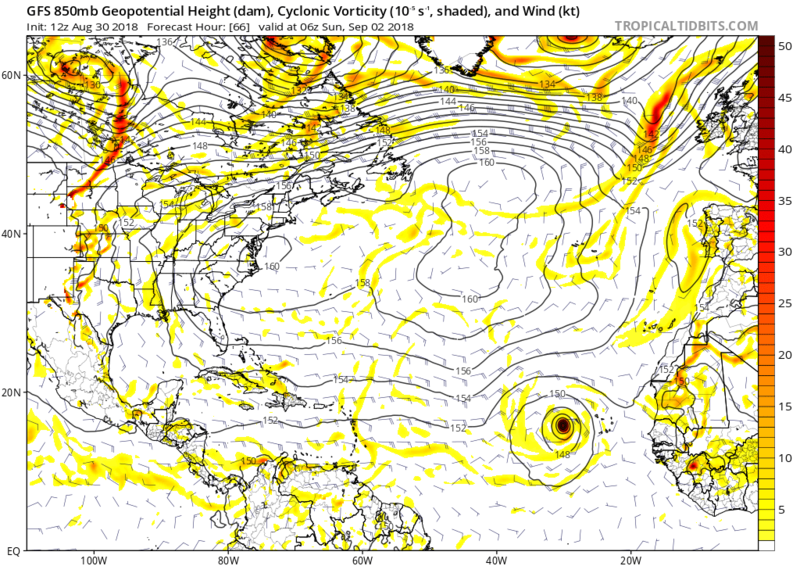 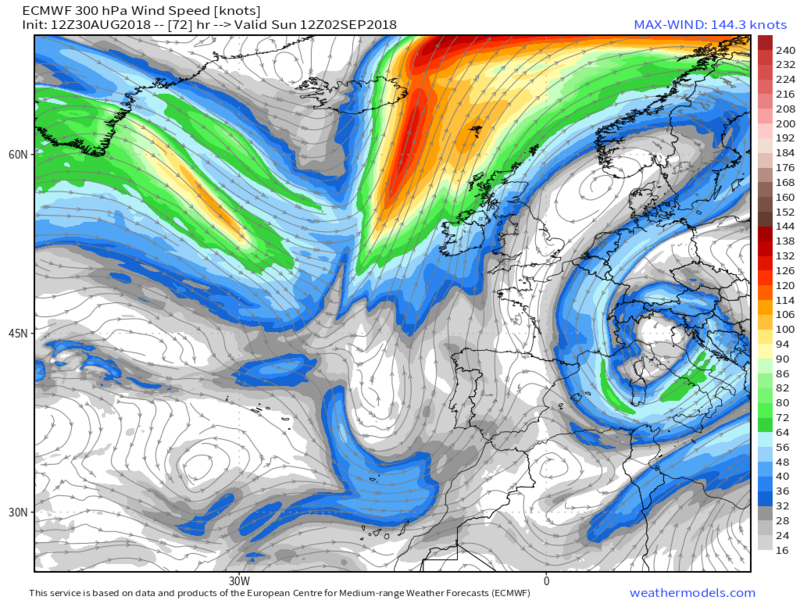 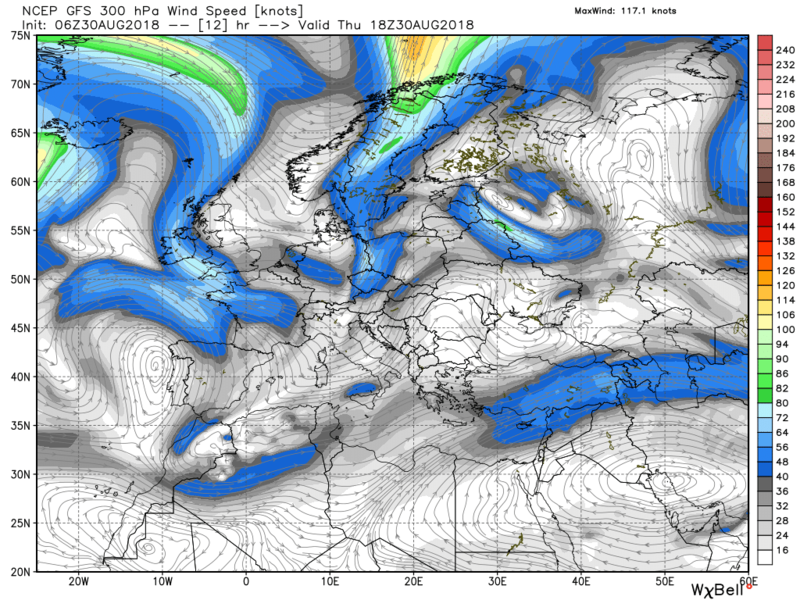 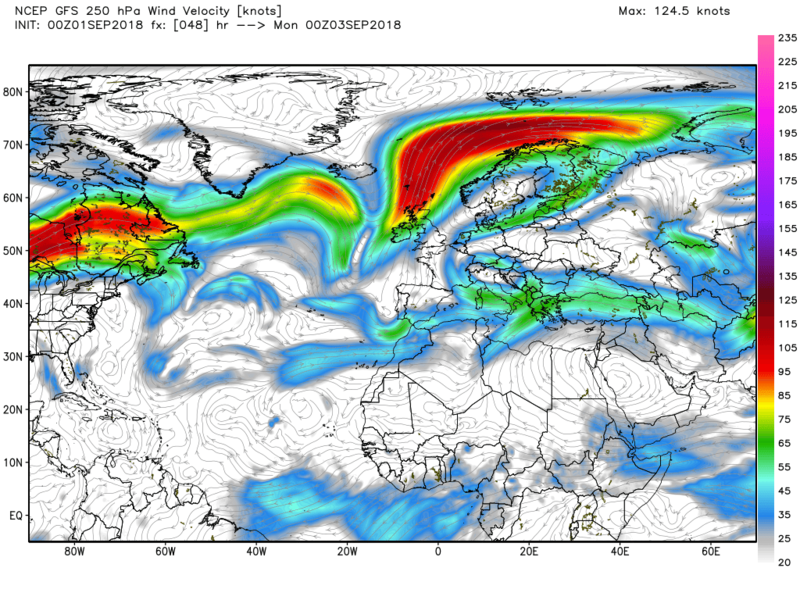 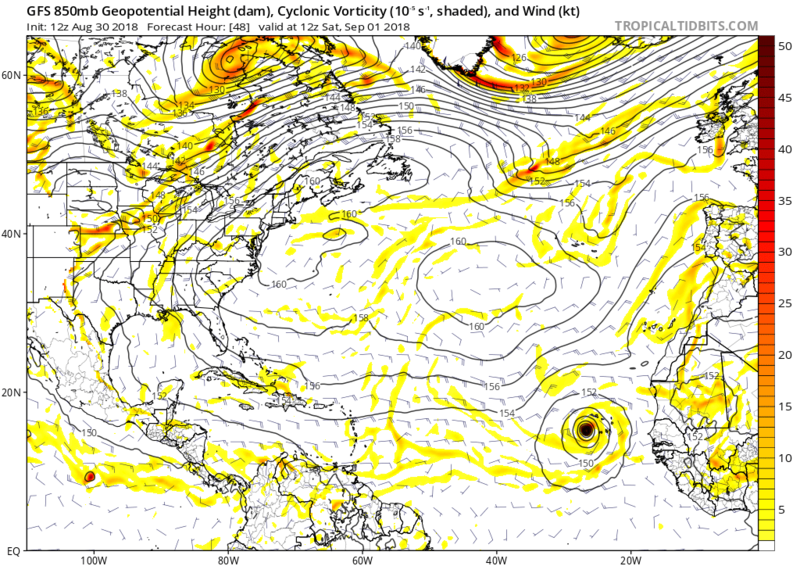 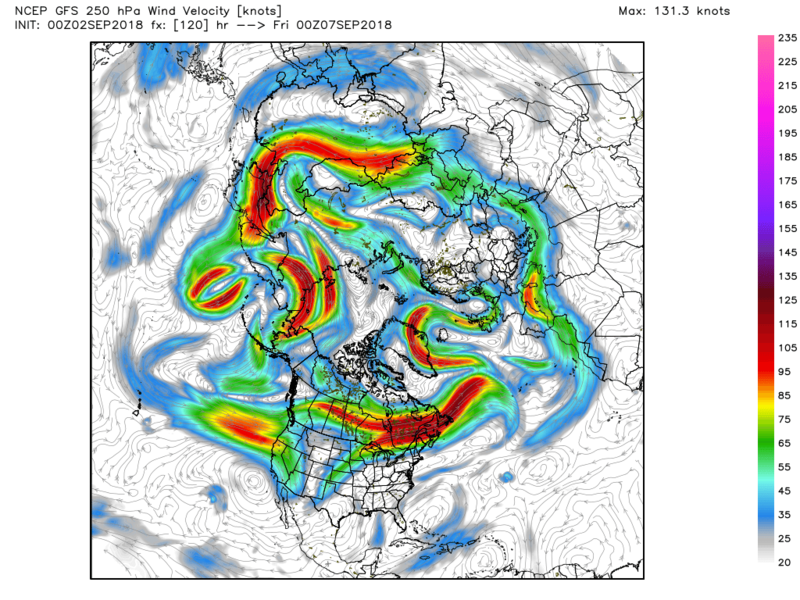 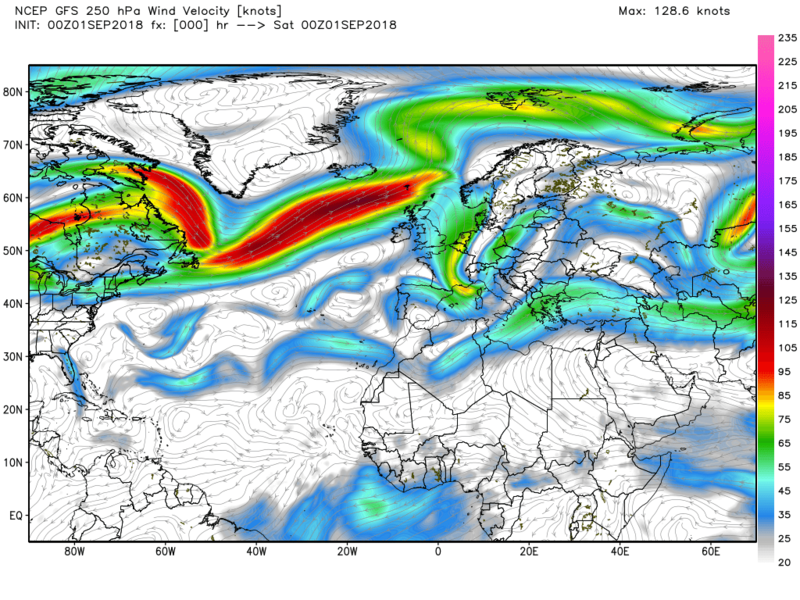 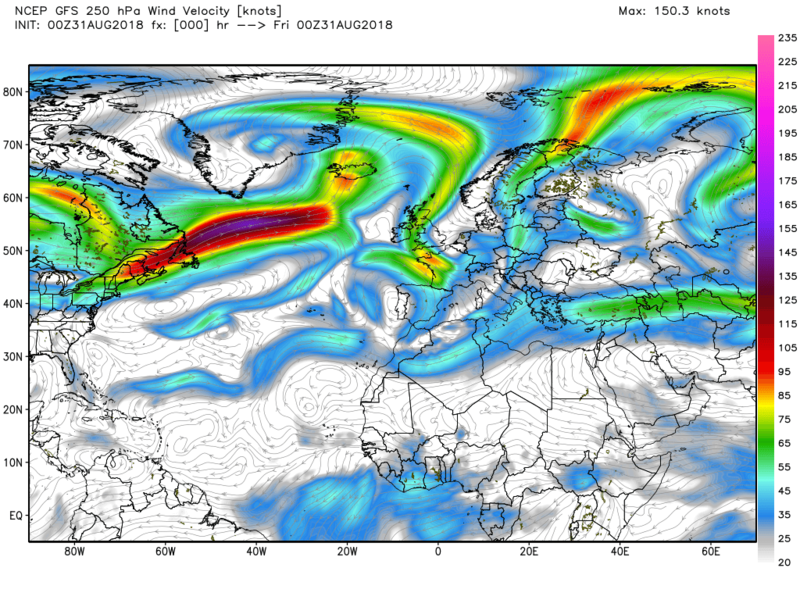 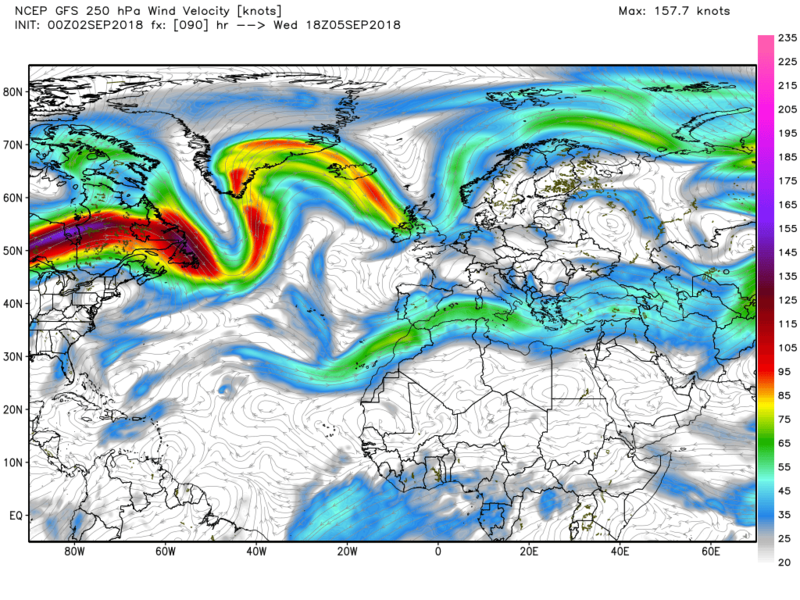 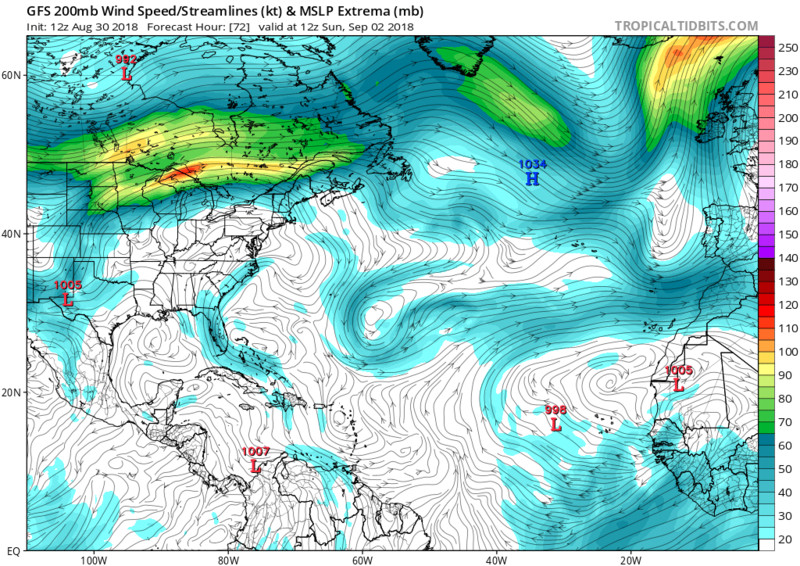 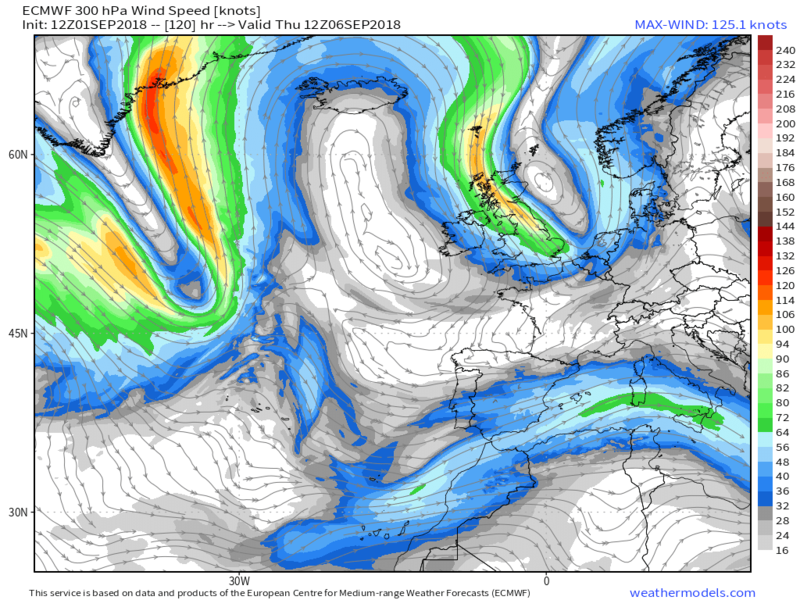 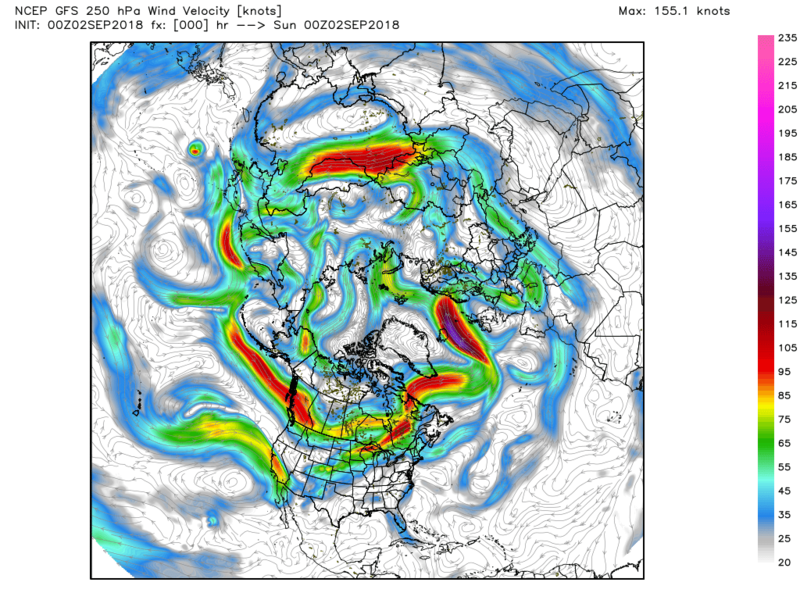 The seeds that are apparent in our neck of the woods involves the upper trough dropping down to the east, severing the Euro < Azores HP axis and promoting intensification of the ridge over the UK. 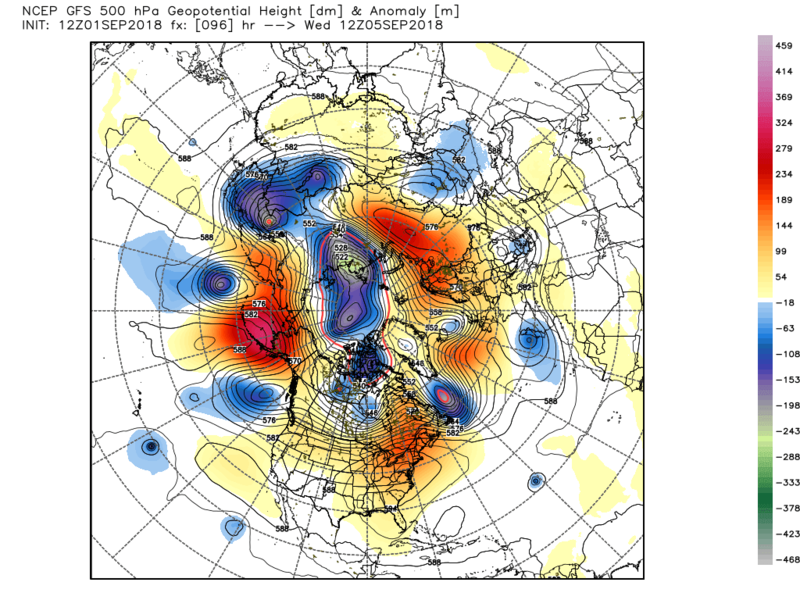 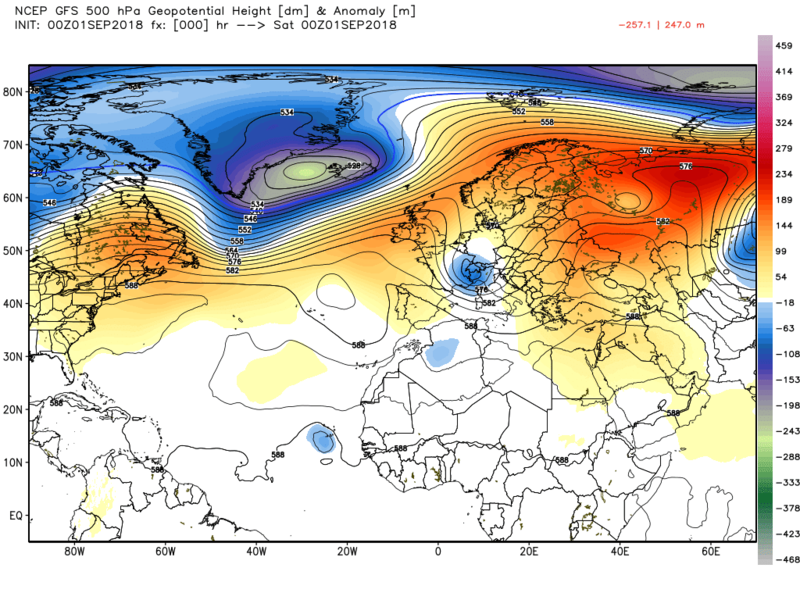 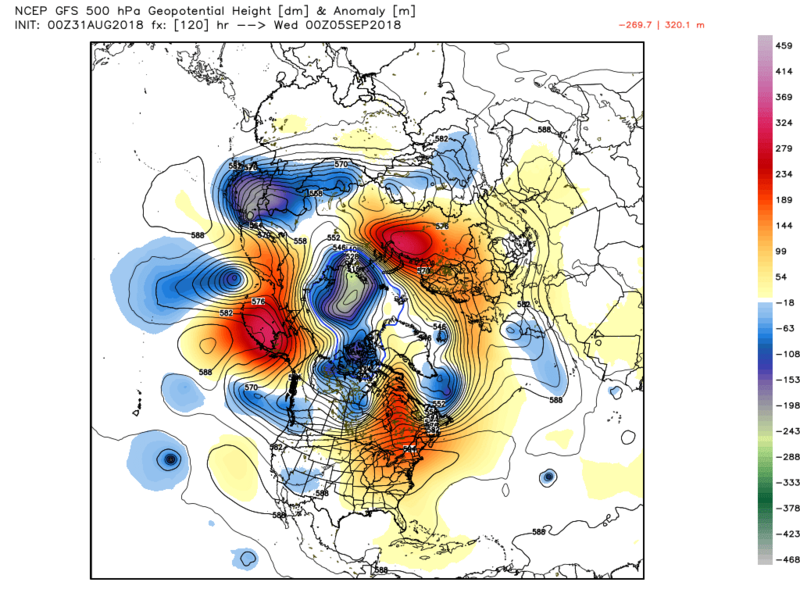 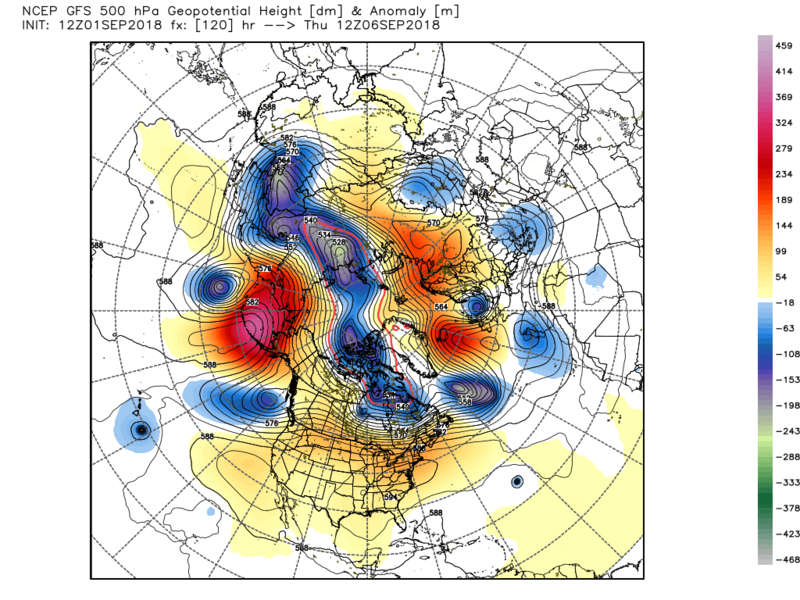 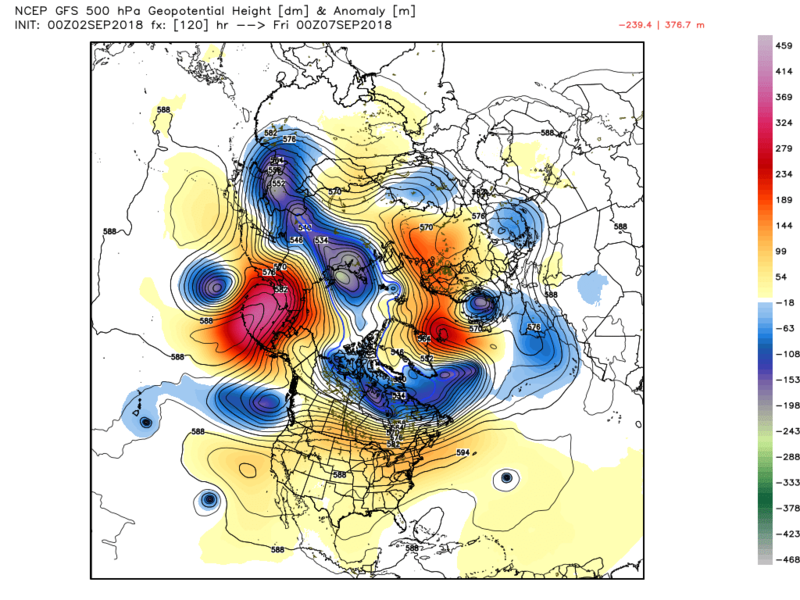 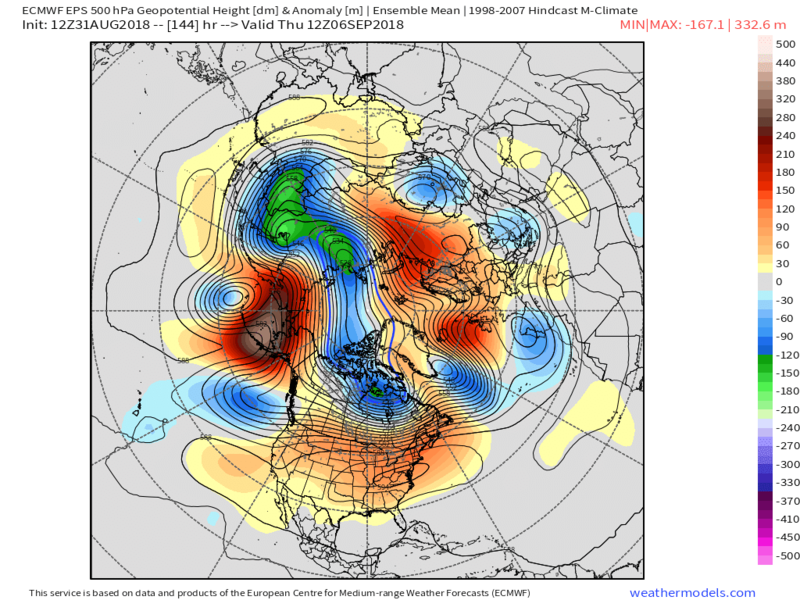 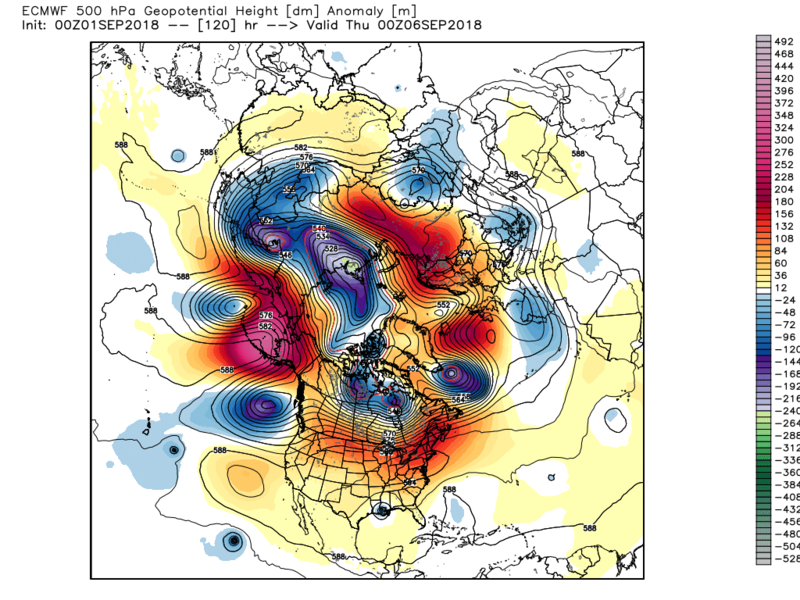 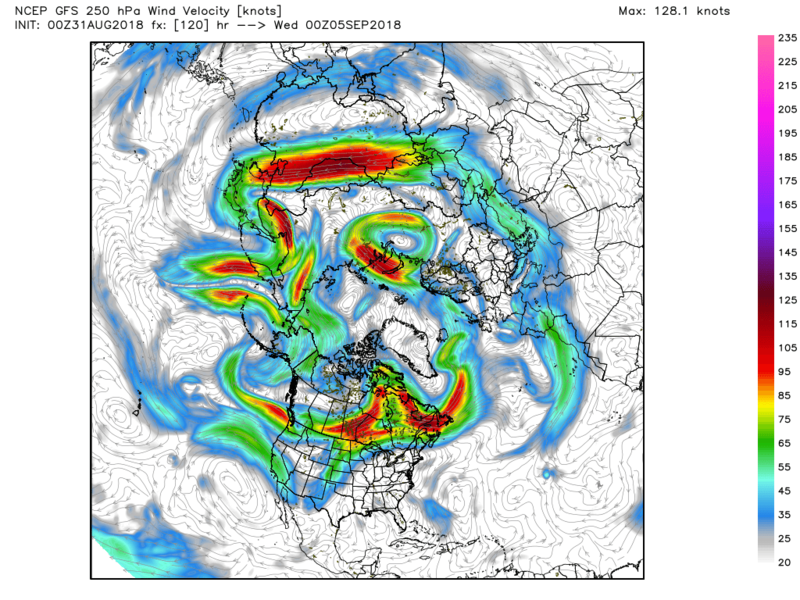 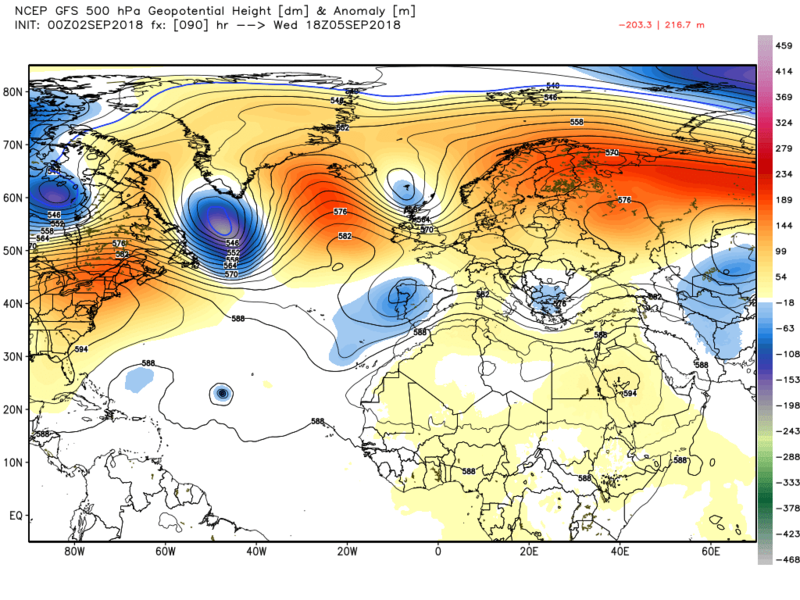 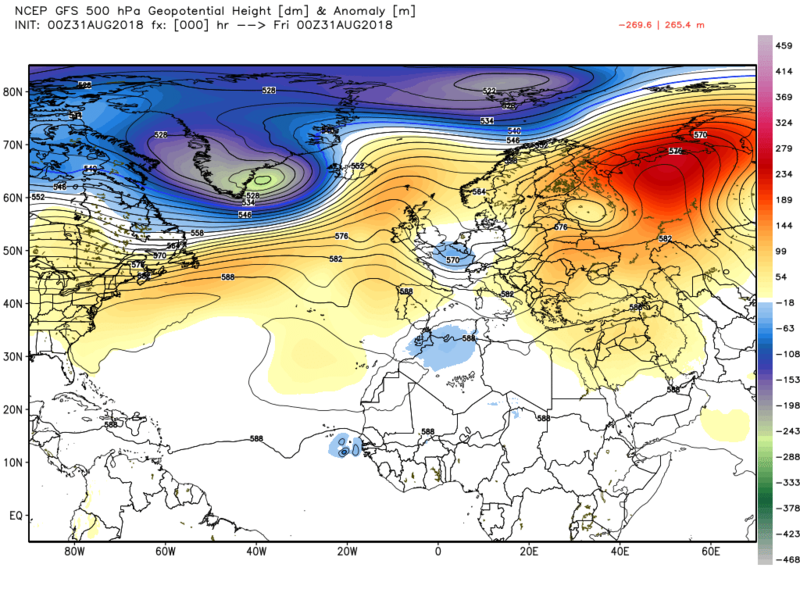 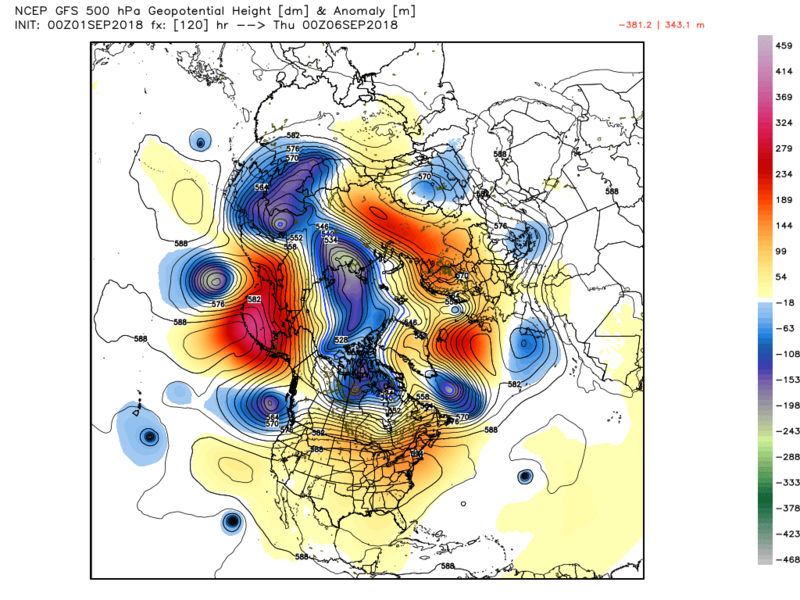 In a NH context this also involves a strong Aleutian ridge and a cross polar trough Russia to Canada, This establishes the surface high cell in the vicinity of the UK Much along these lines. 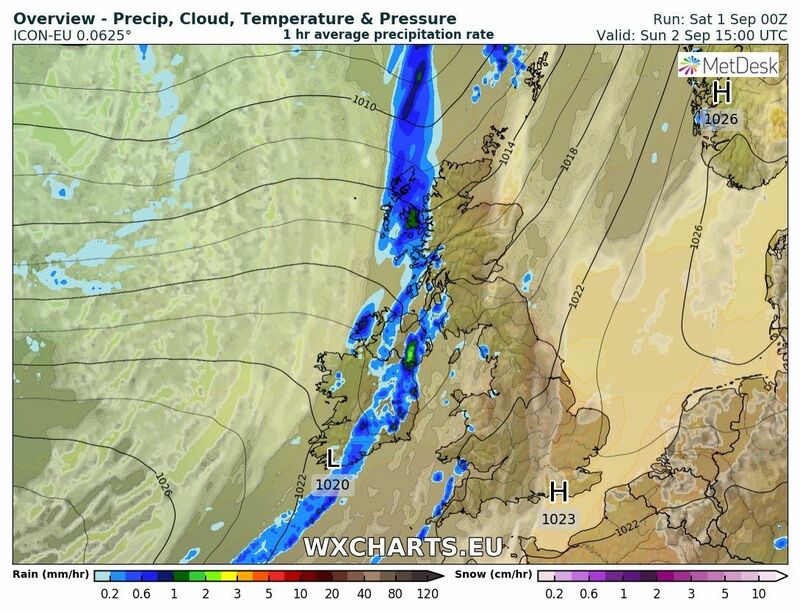 The proximity of those surface fronts means that northern and western areas will be cloudy with patchy rain/drizzle today with the sunny and warmer conditions concentrated in the south and east. 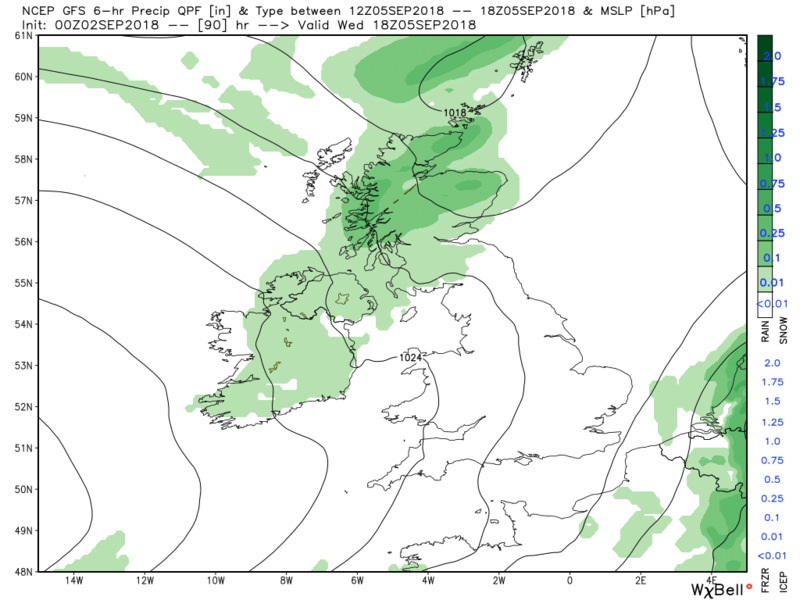 There might be clearer interludes late on in N. Ireland and south west Scotland. 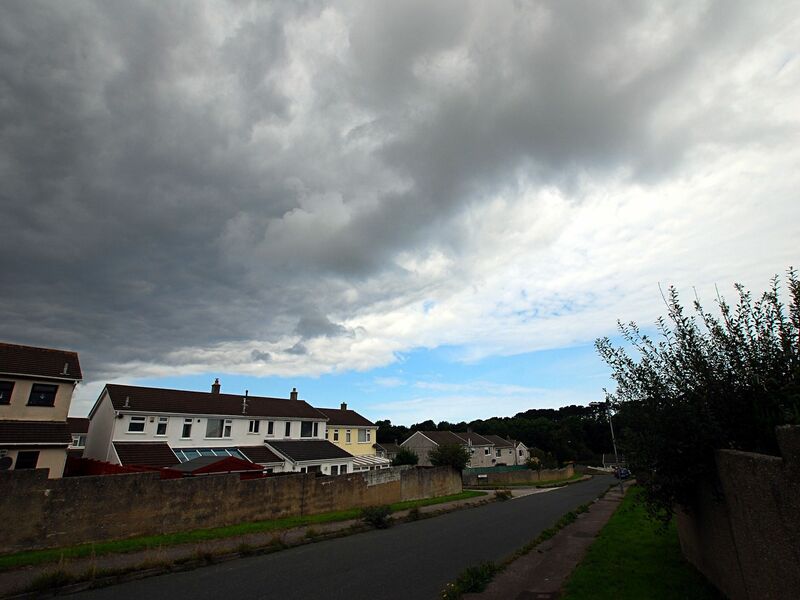 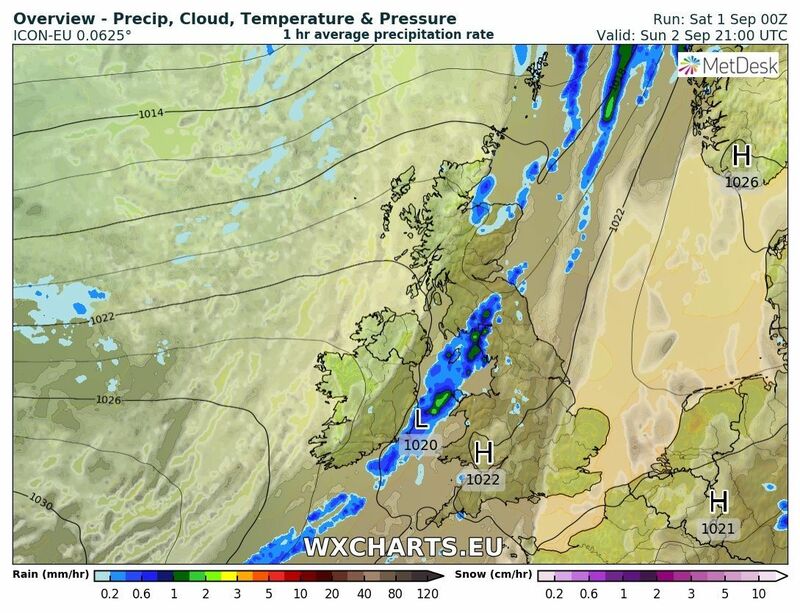 The cloud and drizzle will hang around in western and northern areas overnight and through Sunday morning whilst elsewhere there will be clear spells leading to fog patches by morning which will quickly clear leading to another warm and sunny day. 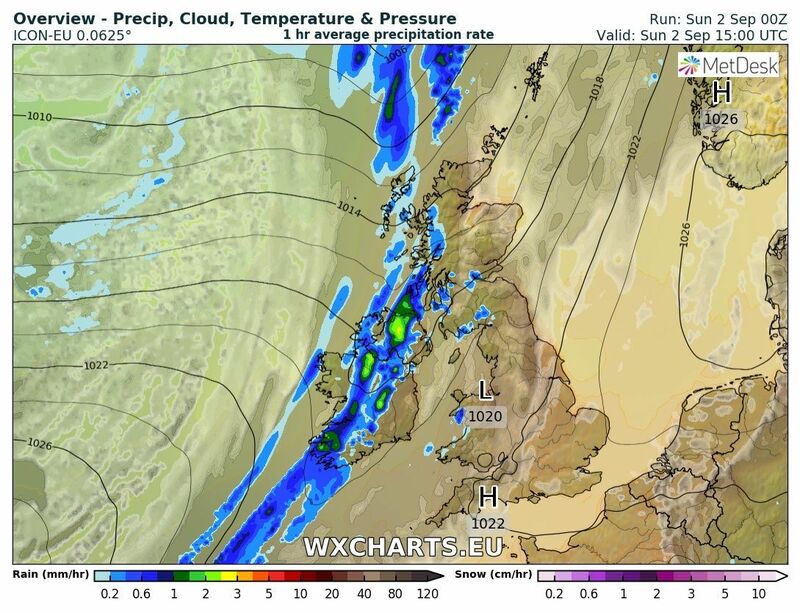 The cloud may thin in some south western regions but during the day the next wave and associated fronts will track NE over Ireland bringing more concentrated rain and freshening winds to the north west. 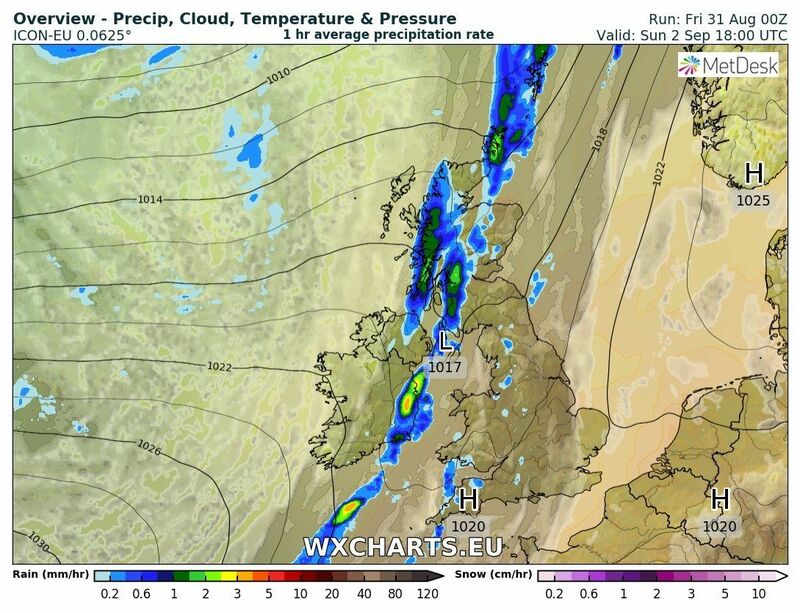 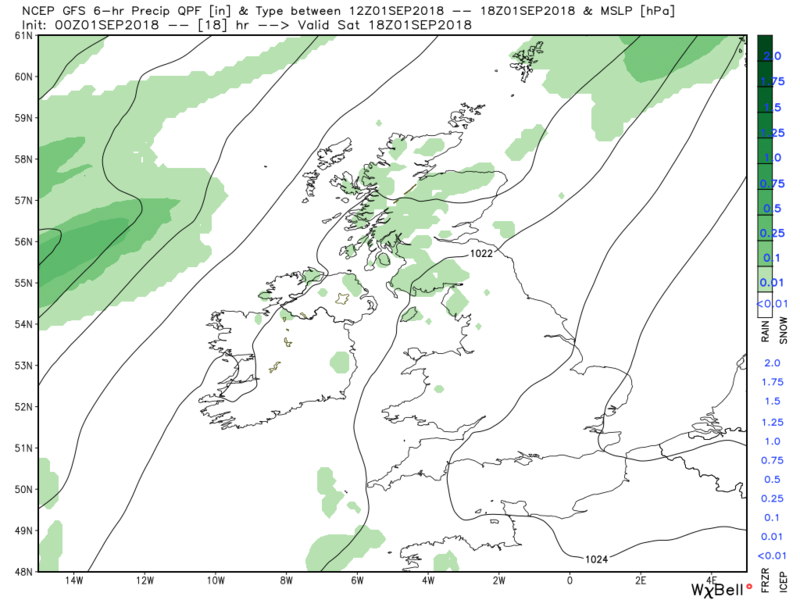 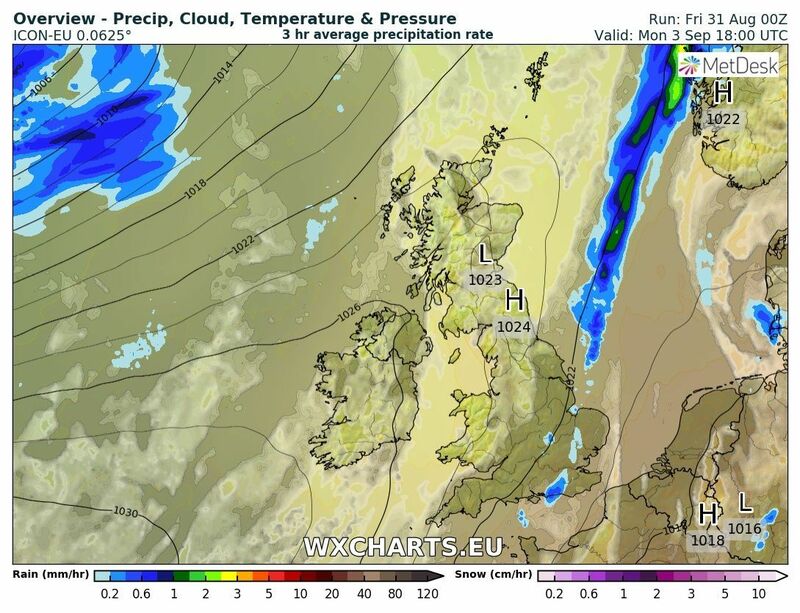 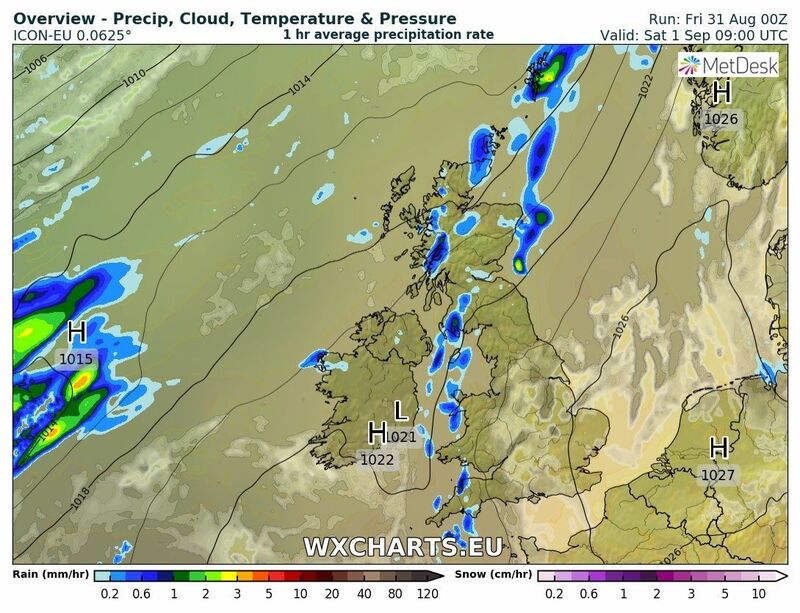 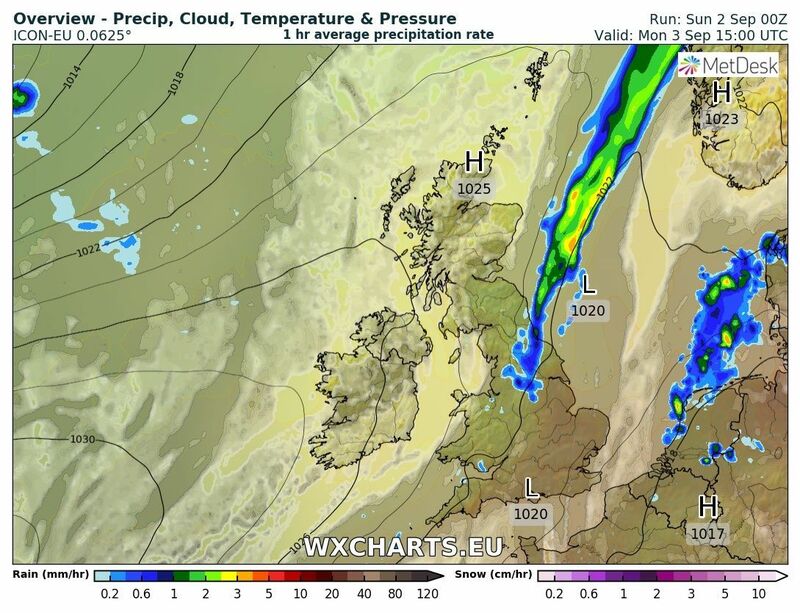 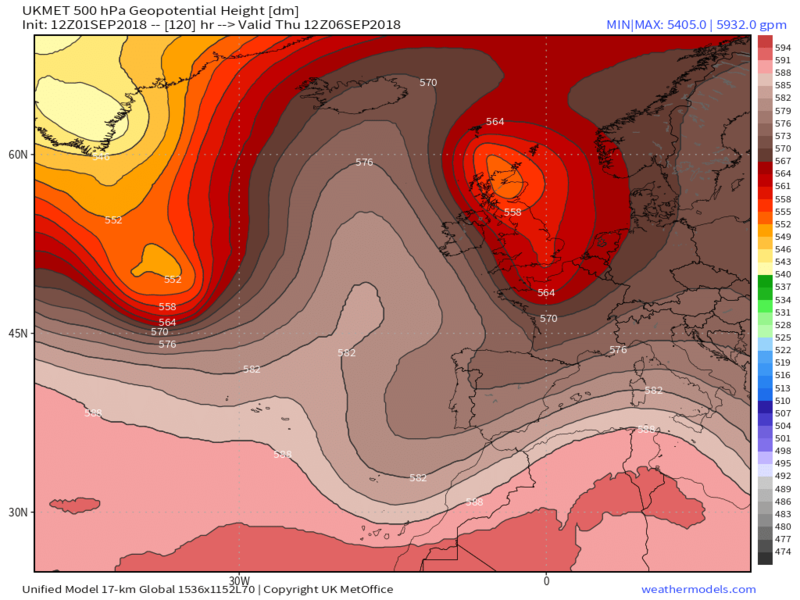 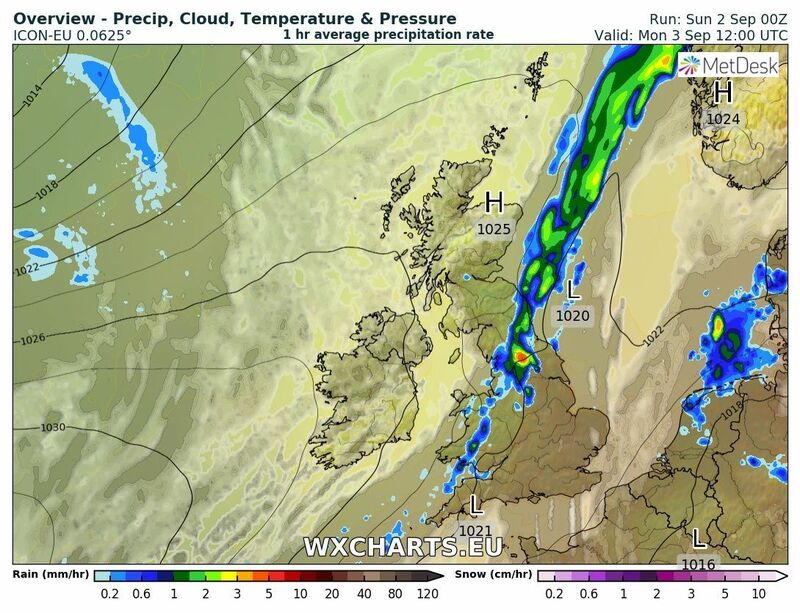 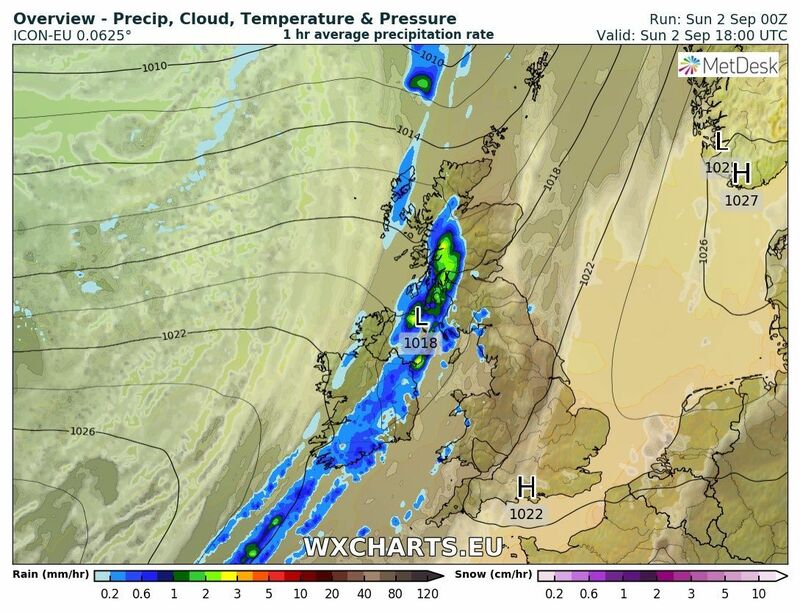 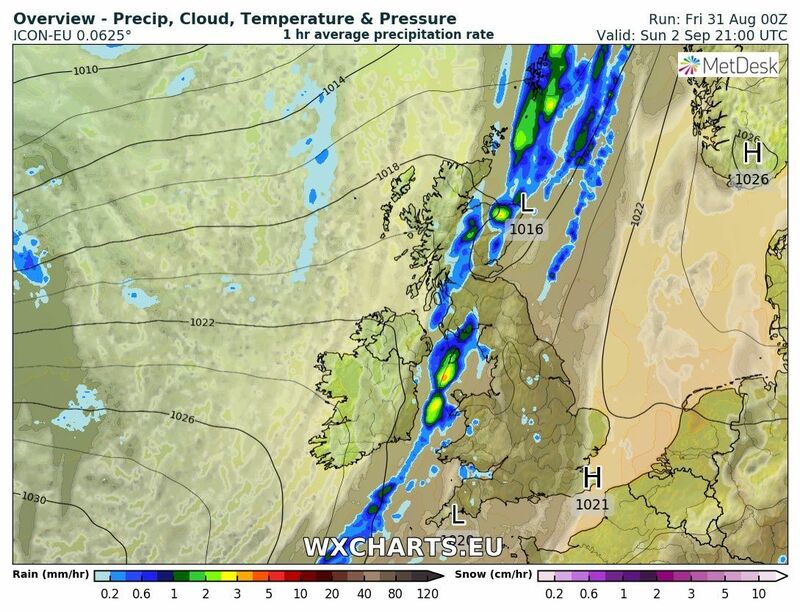 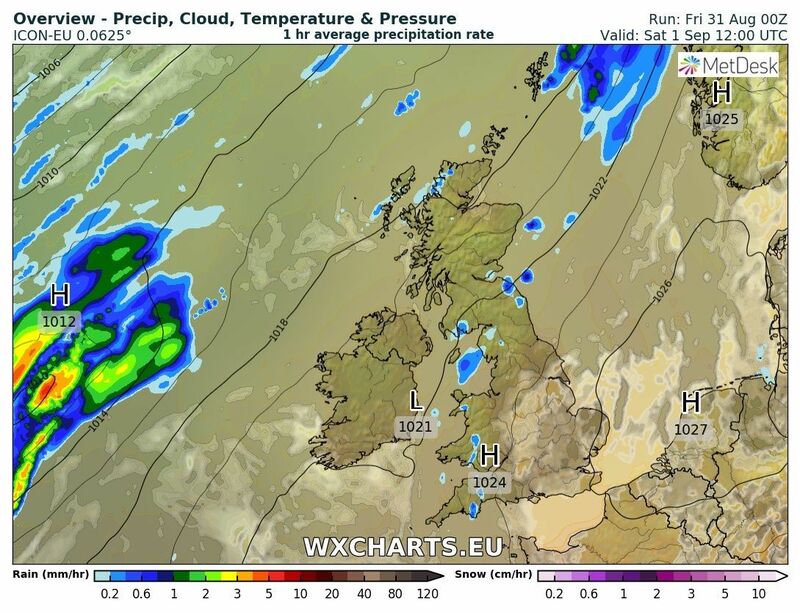 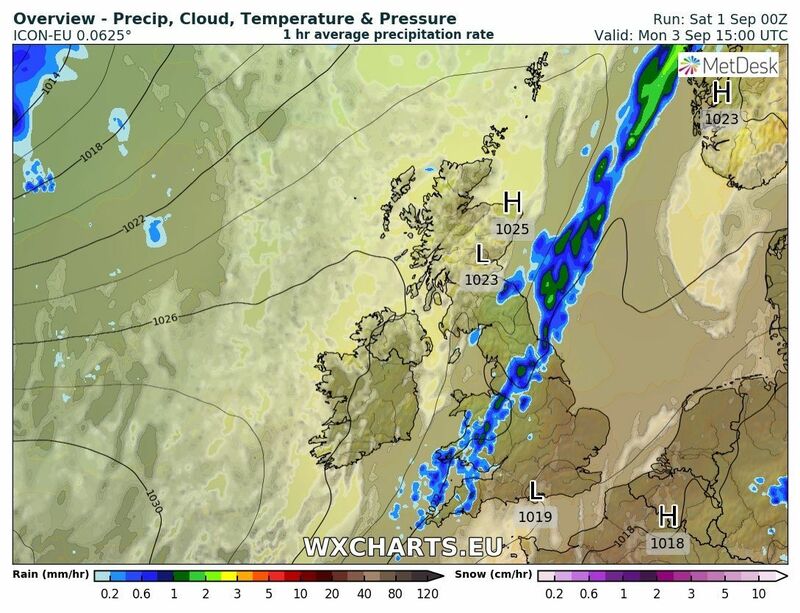 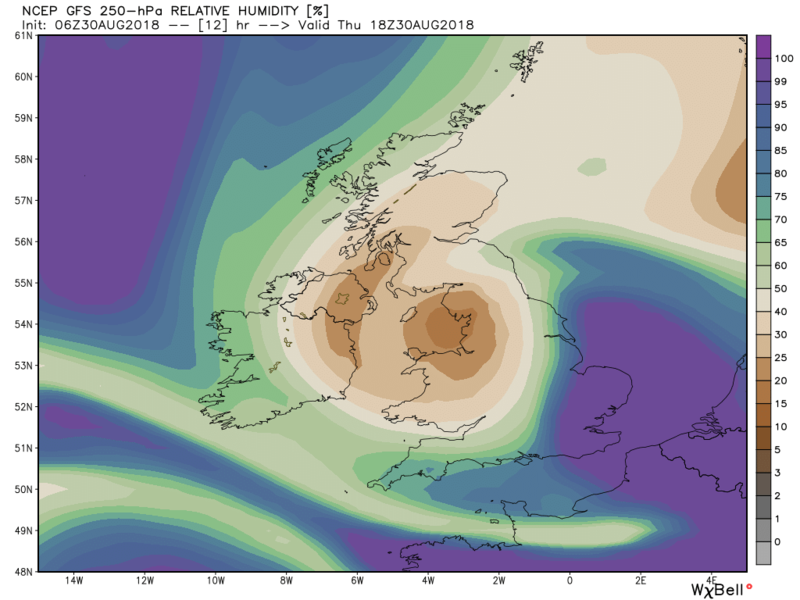 As the ridge becomes ore influential a couple of bright sunny days are on the cards for Tuesday and Wednesday with perhaps some showery rain on the weakening front in the south east and some patchy rain in northern Scotland from another front close by. 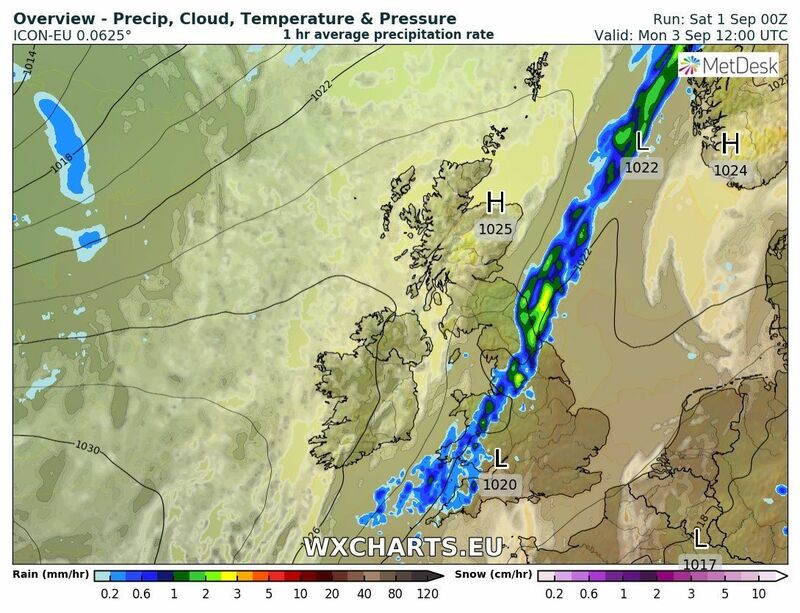 Overnight and through Monday the front and band of rain ( doubled up with the occlusion on the fax charts) continue to track south east but tending to fizzle out as high pressure ridges north east. 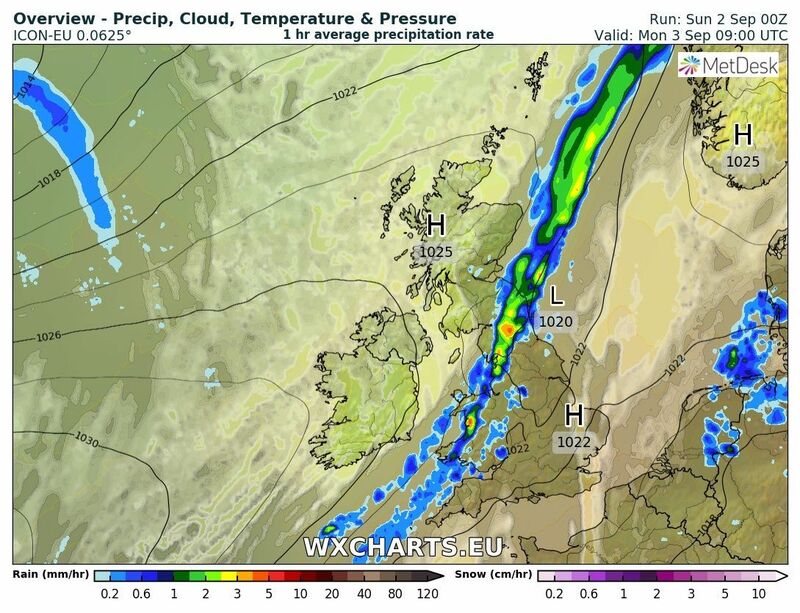 Another warm day to the south east of the front but cooler air behind with the odd shower on the cards towards the far north west. 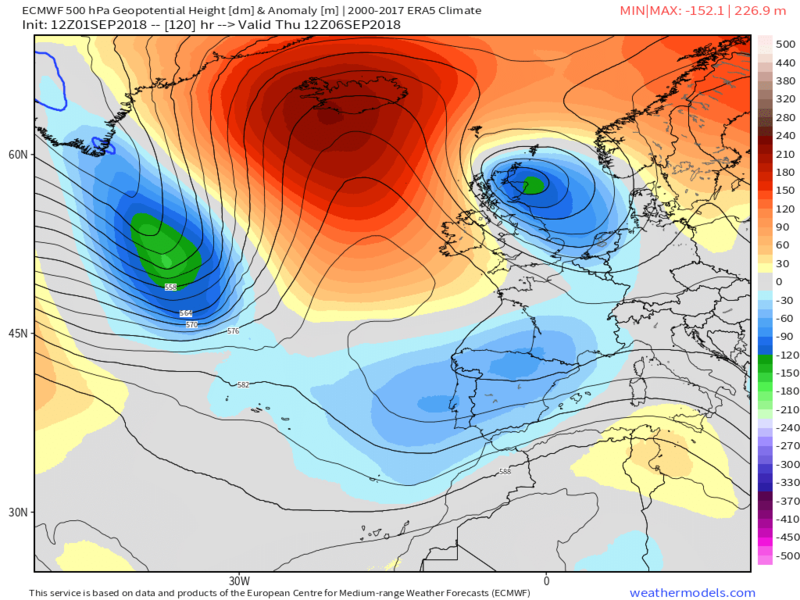 But by Wednesday changes are afoot with renewed amplification in the Atlantic as an upper low arrives in the west accompanied by strong ridging in central areas resulting in another low dipping south east into the North Sea. 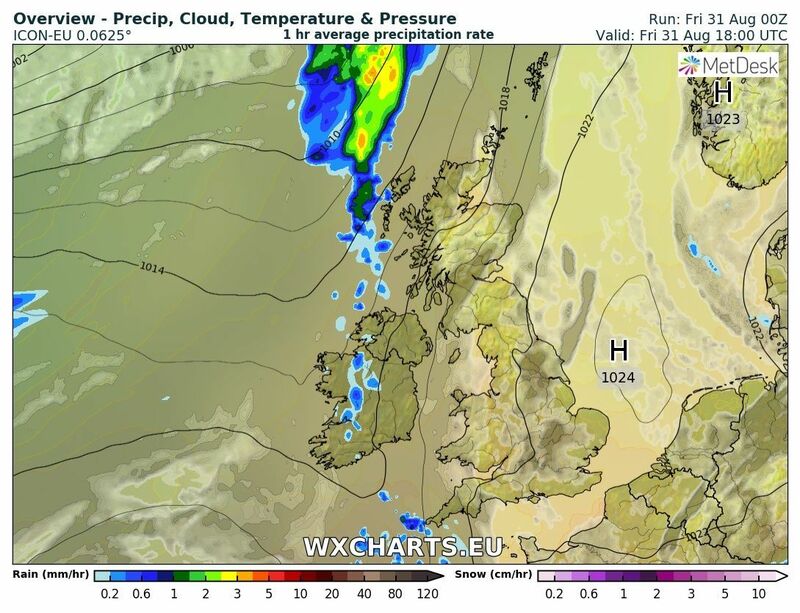 On the surface this drags fronts down from the north west with sporadic rain effecting N. Ireland and Scotland and introducing cooler air whilst the rest of the UK remains dry with temps around average. 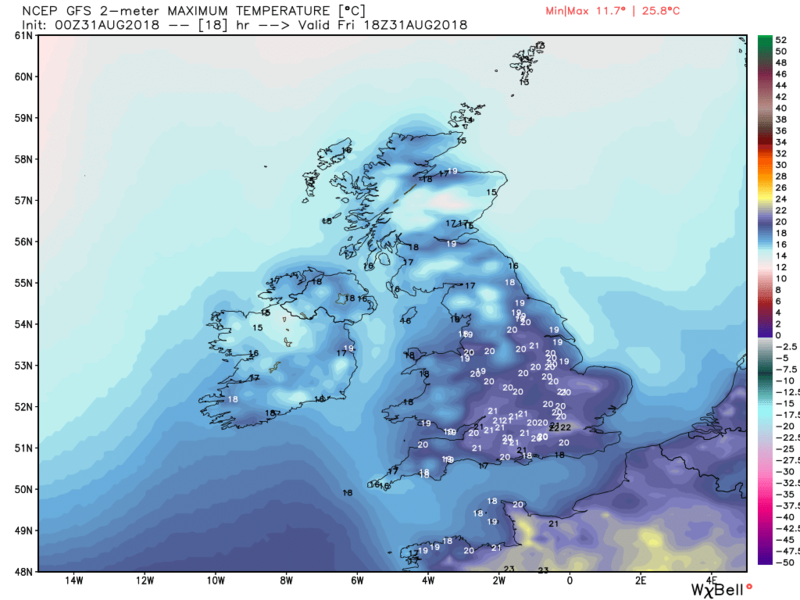 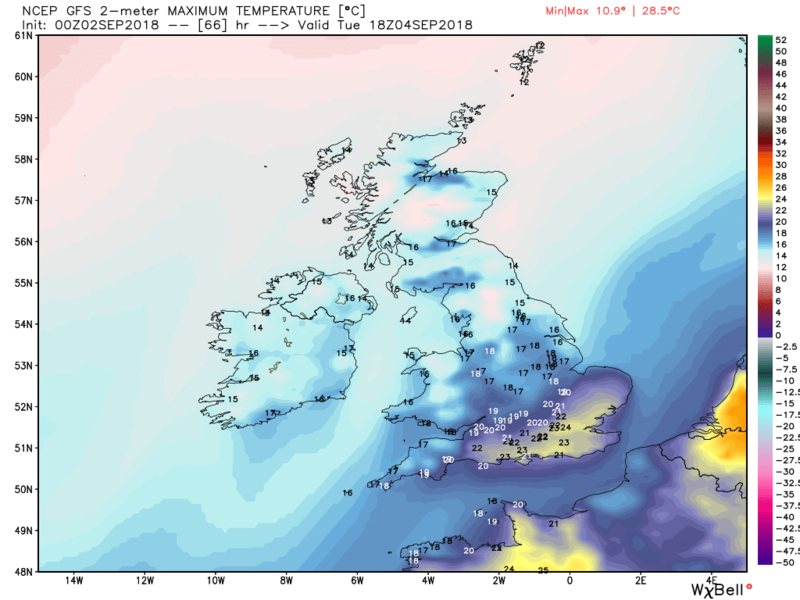 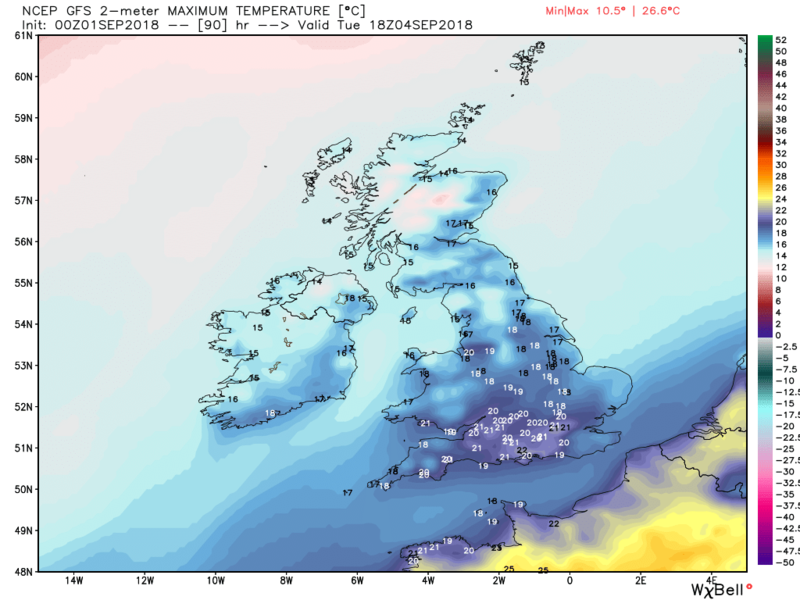 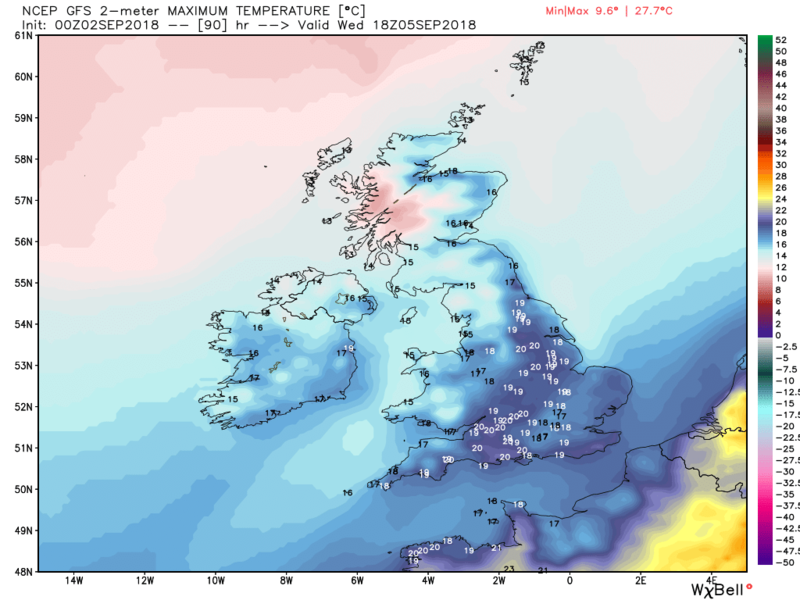 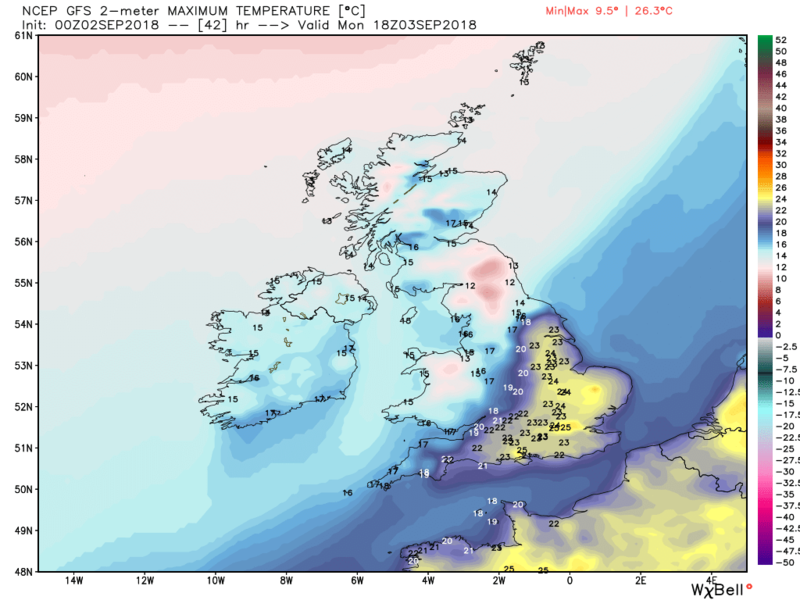 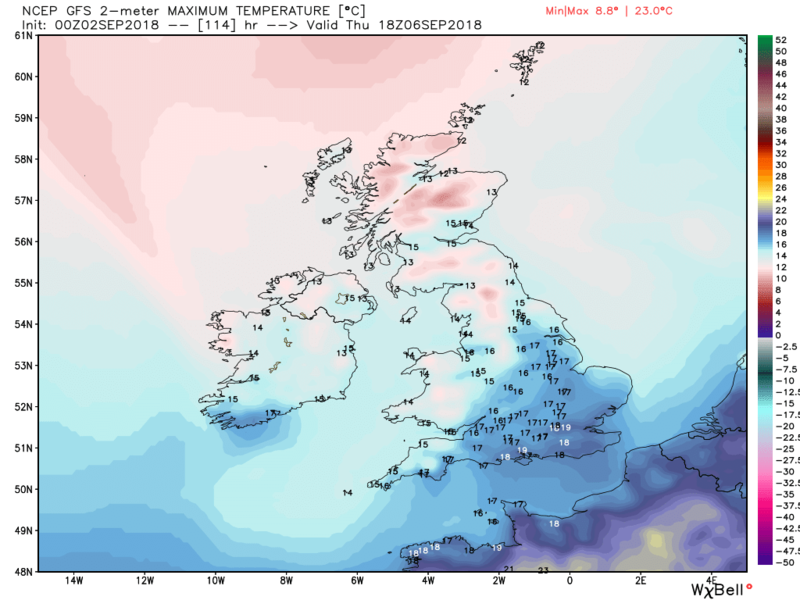 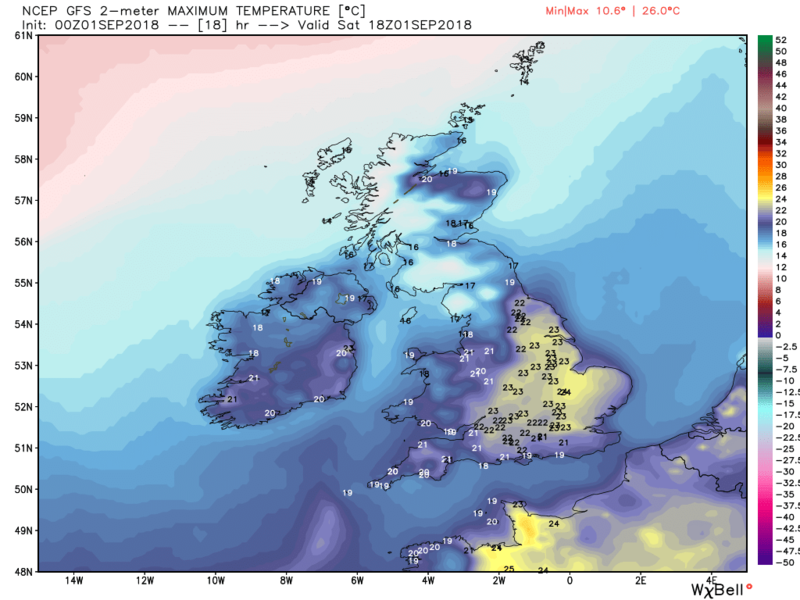 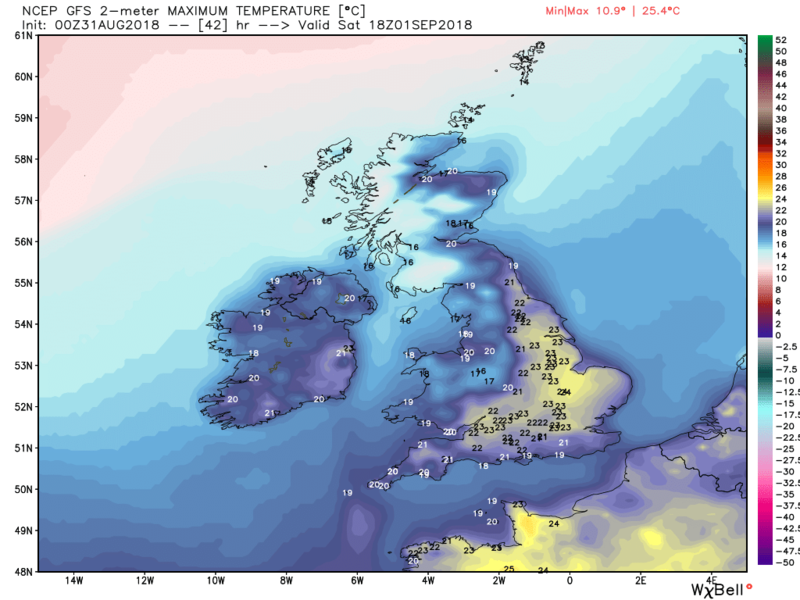 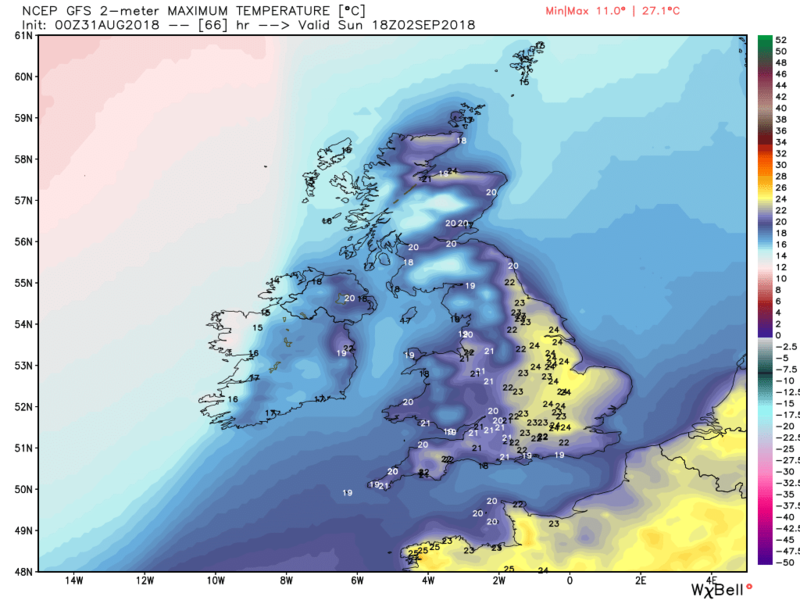 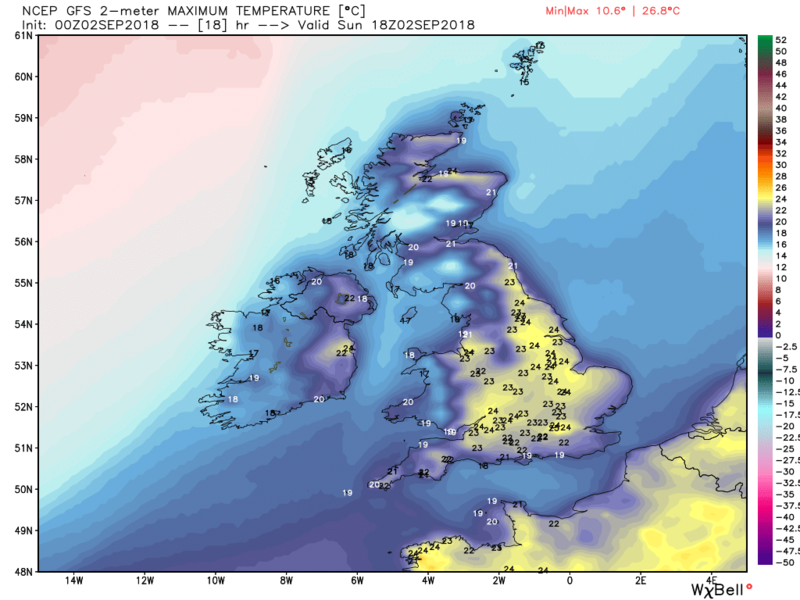 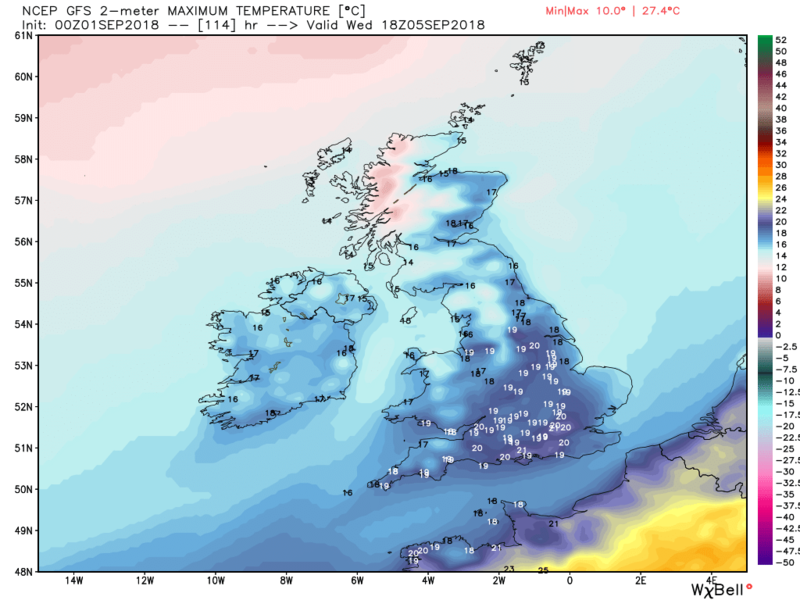 Thursday quite a cool day in the northerly breeze after a decidedly chilly start but generally sunny with the likelihood of some showers in northern areas.